Two weeks ago, I talked about what American Druidry looks like. One of the big issues that came up in conversations here on the blog in the comments and also in the comments on the Druid’s Garden Facebook page was guilt from those of non-indigenous heritage. Guilt about the legacy of abuses against Native Americans in this country–a legacy that continues to this day. Guilt of being here on this land, knowing that many of us who are here now are here because of three centuries of genocide. Guilt about knowing that despite all that we may do now, this past bloodshed colors the way that we interact with the land, our relationships with the spirits of the land, and everything else we try to do to connect with the land and build sacredness. In the last two weeks, I’ve heard how people feel the spirits of the land aren’t open to them because of this legacy, how they don’t even know what to do to begin to rectify it, or they don’t think they have a right to do anything to the land, or how they are afraid to act because they might do more damage. For some people, these feelings of guilt are literally preventing them from doing much of anything because they don’t feel they have a right to the land. I’m glad we are having these conversations, and I think these are the start of understanding a way forward. This week, I want to more deeply share my perspective. That is, I want to talk about moving beyond guilt and doing reparations: the work of repair. These kinds of conversations can be difficult, especially today, and there’s a lot of question about who even has the right to speak on a topic. Before I begin this conversation, therefore, it is useful to know who I am. I’m a druid, and I have been walking this path for over a decade. I’m a permaculture designer, an herbalist, an whimsical artist, a land healer, a teacher of many things. But maybe when we say”who I am” what we mean is what blood I carry. On one side of my family, I am a fourth generation descendant of Irish immigrants who came to the US after the potato famine forced many farmers to leave Ireland. These proud Irish came, settled here in Western PA, and mined coal. On the other side, my family has a very…colorful past. We have in the same generation (mingled in later bloodlines) a very well-known historical figure, a prominent general, who successfully defeated the Native Americans on their own soil and slaughtered thousands in his lifetime. We also have Shawnee man of whom little is known (as it is a taboo topic to the older generations in my family, but DNA records demonstrate that this “unmentionable fact” is true). We also have Pennsylvania Dutch (that is, PA German) ancestry. This pretty much makes me a mutt with direct ancestral ties both to this land and the bloodshed that happened. Does this mixed ancestry give me the “right” to speak on this issue? I have no idea, but at least, now you know where I’m coming from and can evaluate what I say based on that, if such things matter. To me, my own ancestry or what my ancestors did or didn’t do isn’t as important as the work I do today. What was done before me were other people’s lives, decisions, and choices. I live in the shadow of those choices, and I certainly have to deal with them, but I can’t change the decisions of my ancestors or others here that caused these things to happen. I can’t change the bloodshed that was caused by General George Custer and his contemporaries. I can’t change the pillaging of the Allegheny Mountains for coal, steel, and iron. I can’t change the past. The only power I have is the work I can do in the present. I think that this is the best response I can have: to help repair the damage that was done, to help put balm on these centuries-old wounds, and to rebuild my own relationship with the land. And so, I focus my energies on that work, rather than lamenting the past or my ancestors’ place in it. When we hear the term “reparations”, most frequently in the US it is tied to discussions and activism surrounding the monetary compensation for past horrible crimes (genocide, slavery, war crimes, etc). But this term has a lot of meanings, and its useful to explore those, especially in the context of nature spirituality on American soil. All three of these definitions give us something to consider in terms of the work of repair. We do need to be active in the tending of the land (definition 1a-b). We also do need to make amends for the wrong or injury that has been done to the land and her peoples. And finally, we do need to find some way of compensating those who have been wronged. And unlike ancestors’ actions and the choices of past generations, which is inherently disempowering and makes us feel bad without anything to be done, the work of repair offers us the ability to actively engage in this work today. First, Wendell Berry’s Unsettling of America, in the opening chapters, Berry describes two orientations toward the land: that of the exploiter and that of the nurturer. He describes the exploiter as the agribusiness person who seeks to extract as many resources as possible from the land for profit. We might easily point to any number of colonizing activities, stealing land from native peoples, pillaging natural resources, fossil fuel extraction activities, mountaintop removal, etc. In other words, he describes the behaviors and activities and unfortunate cultural heritage of the present day United States, a cultural heritage that each of us have inherited. The nurturer, by comparison, is a small family farmer in Berry’s estimation, someone who is as much concerned with the health of the land as he/she is with its productivity. The nurturer, then, makes care a primary concern and thinks not only about what is taken now, but how those actions impact the health of the land and her people. Expanding on this notion of care, the permaculture ethical system offers us further tools. The ethics of people care, earth care, fair share, and self care are interwoven: to care for the land is to care for the people, to take one’s fair share is inherently to care for self and others, and so on. The point here is care as a primary virtue. Within permaculture is the idea that humans can be a force of good. This leads me to the third thing: we can tie care and nurturing directly to the work of druidry through the tradition’s emphasis on peace, the work of reciprocation, and the work of honoring the spirits. I think this is critical: its not just that the land is somehow under our care, but that we are in direct relationship with it. Its a deep reverence and respect that druidry offers this conversation–the work of peace. In my experience, it is necessary to show the spirits of the land that I’m a different kind of human: the last four centuries, particularly on the East Coast of the US where I live, have primarily involved people who look like me pillaging the land. When I walk into the woods or enter any other natural place, how do the spirits know I’m a different kind of human? Certainly not by what I say–the cultural legacy of the US has shown, time and time again, how words can’t be trusted. No, the spirits of the land will know me based on my actions: what I do, directly, to care for the land and engage in the work of repair. It is through this work, I believe, that I have continued to develop a very deep relationship with the spirits of my landscape, of the Allegheny Mountains, and of many other places that I have visited. I can’t sit here and tell you what you should be doing to do the work of repair. Each of us has to find our own way forward with this work given our limitations and resources–but the above philosophies and orientations and the above definition can certainly help put you in the framework for the repair work. What I can do, though, is tell you a bit about some of the things I’ve been doing and how that fits the above framework. I’ve talked a ton about energetic repair already through my long land healing series from last year, so I’m going to now give some physical repair examples. I wanted to share three recent examples of the work of repair work that will heal and strengthen not only the land here, but my physical connection to the land. Some of the trees planted! I think Black Friday is the most horrific day of the year, it is an anti-holiday that pays homage to mass consumption and cycles of waste. I went out once when I was 17, and have never participated in it since then. And so, to counter the consumerist frenzy that takes place on Black Friday, I always like to do something in line with people care, earth care, or fair share on that day. I think this is a wonderful way to show the spirits of the land that you are a different kind of human and reject the lure of consumption. 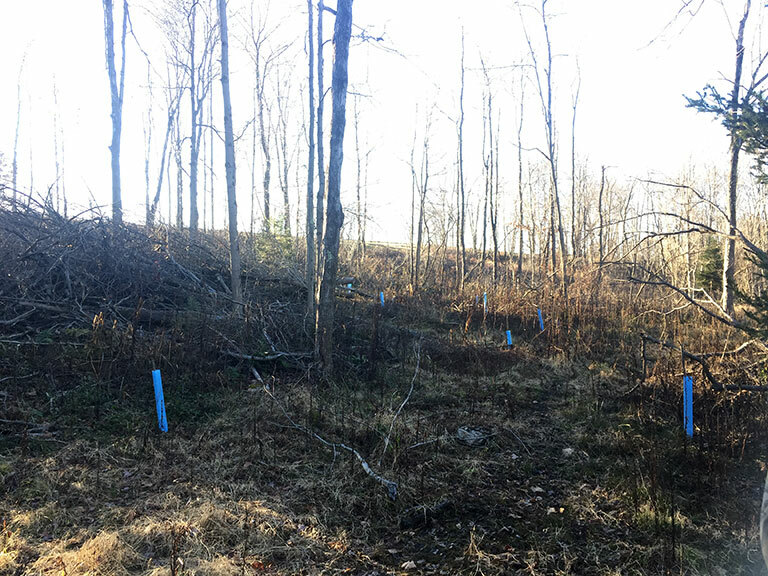 This past Black Friday, a friend and I planted 45 trees on my new property. Earlier on this blog I mentioned how the land here has been timbered four times in forty years, and how I was working with the spirits of the land here to help heal. 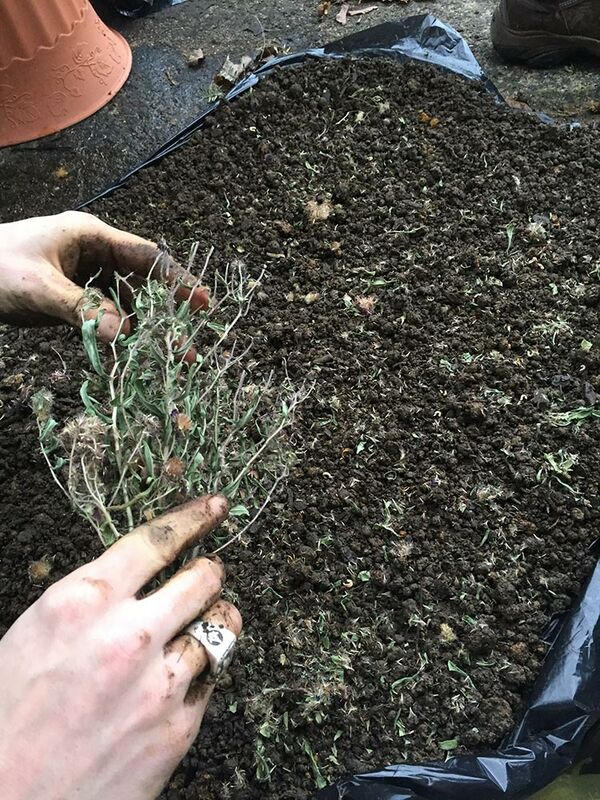 As part of that work, I have been working to replant the forest–both with seeds as well as with small trees. 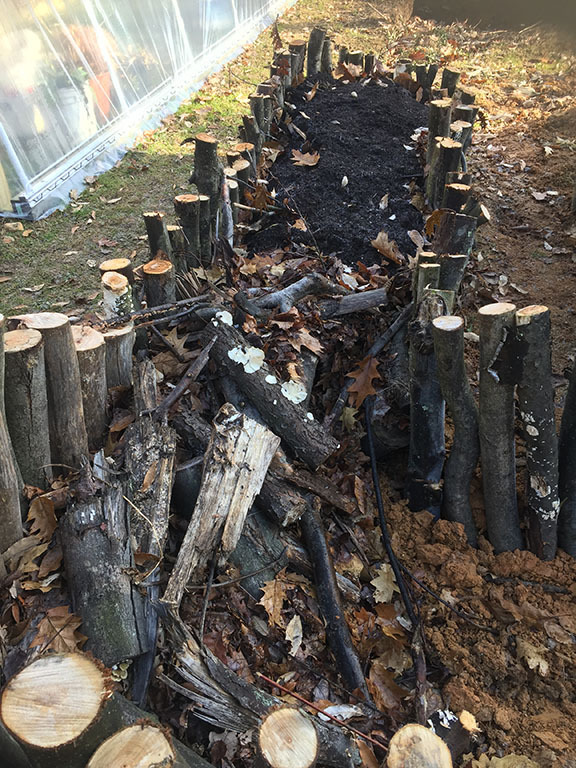 After consulting with the spirits, we’ve decided to try to bring this forest back to something more akin to what it would have been before my white ancestors arrived: in PA, that’s about 33% chestnut with other hardwood nut trees and an understory of PawPaw, Elder, Spicebush, and more. And that’s exactly what I worked to plant: 25 chestnuts, 20 paw paws, and a few other assorted nut and fruit trees (persimmon, hazel, and, to anticipate more climate change, Pecan). It was a long day of backbreaking labor, but at the end, it was a day well spent. Rather than engaging in activities that took from the land (through the manufacture of consumer goods, the spending of fossil fuels to visit stores, etc), I used only my own human energy to move trees, move compost, plant the trees, and more. After that day, each day, I walk out on the land and see the many blue tree tubes and smile with joy. And since then, I’ve also done ritual to support their growth and health. The spirits of the land are happy that this kind of work is happening here, and that brings me into a closer relationship with them. 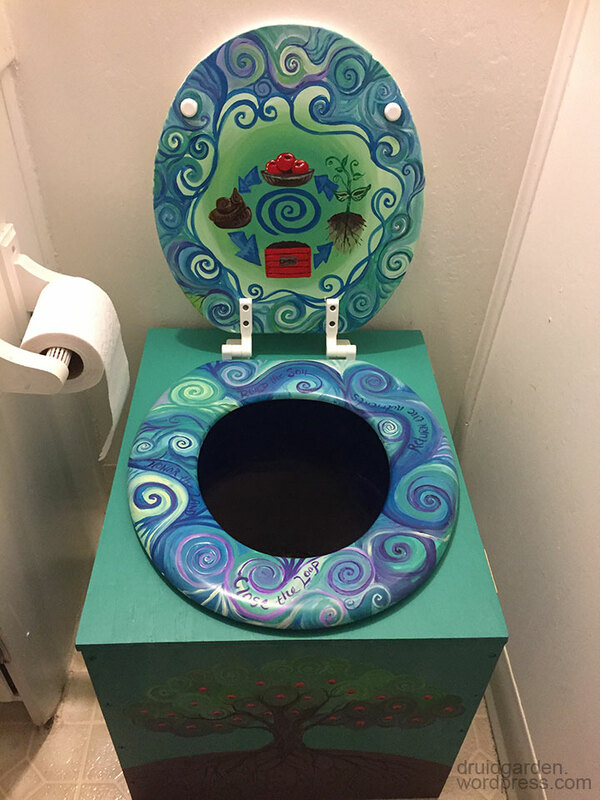 Last year, I wrote about Humanure composting and shared my design for a humanure toilet (modeled after the “Lovable Loo” design from the Humanure Handbook). In that post, I described why people compost their waste and how to do it. I have continued to engage in this practice and I believe it is a wonderful way of engaging in repair work. I have decided to compost down and then return all of my own waste to the wild areas on my land since so much had been taken from them with regards to logging. I find that this brings me back into cycle with the land and honors the land by putting resources back (rather than sending them “away” to mix with municipal septic systems). One of the things I’m doing now that I’m on my new land is to take this a step further by switching my cats from a clay-based litter to a wood based litter (made of recycled waste wood). Once this proves successful, I will also compost all of their waste in their own compost bin, and again, after two years of composting, return those resources to the land. The point here is simple: what my household eats (my household being myself and my two cats) is taken from the land and therefore, in any form, should be returned to it. That’s the work of care and nurturing, and that brings balance. A final way that I’ve long engaged in the work of repair is cultivating a healthy soil web and replacing lawns with gardens of all kinds. As I’ve discussed before, the lawn is a site of consumption: it does not offer a healthy ecosystem, it does not offer food or forage to wildlife, and it certainly is not healthy from the perspective of nature. Developing gardens (for wildlife and humans) and converting lawns into other things is inherently repair work. It repairs not only the relationship between the spirits of the land and the human, but also helps repair the human’s spirit. 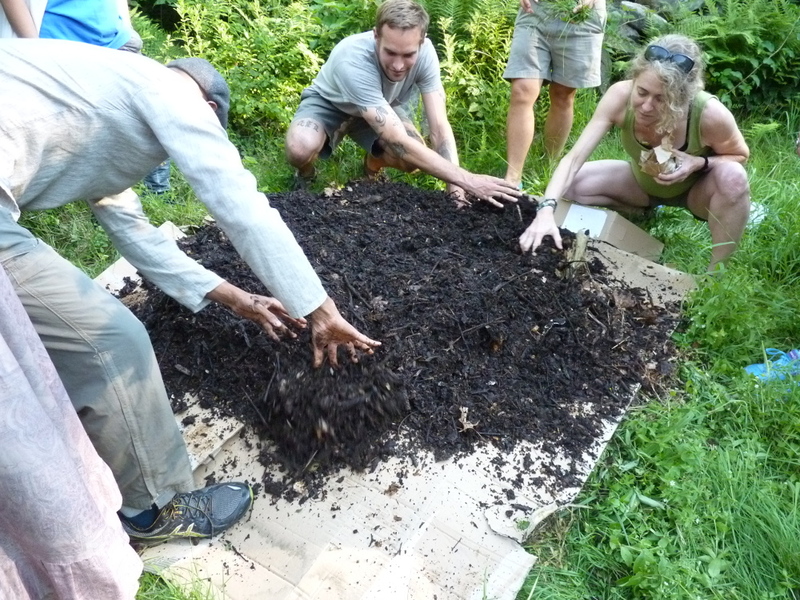 There are lots of ways to do this: a common one is through sheet mulching (which I wrote about here and here). You simply add a weeds suppression layer (cardboard most often) and then layer on organic matter (fall leaves, manure, finished compost, wood chips–many things that other people see as “waste” and leave on the side of the road for you to pick up). This takes away the grass and immediately gives you a good growing media. This isn’t the only technique to do this (I’ll be talking about another–hugelkultur–in an upcoming blog post) but it is certainly a great one to get started! I also want to talk about people care here before I conclude today’s post. There are no longer tribes of native peoples where I live; all that is left of them are the place names that once represented them. However, in other parts of the US, primarily out west, we certainly do have many native peoples still actively fighting for the rights of the land, the water, and their sovereignty and dignity as people. Further, we have indigenous people all over the world who also are fighting similar battles. And if we care about the work of repair, we also have to care about–and fight for–them. I think part of the work of repair can also be supporting native peoples: writing letters to representatives, offering monetary donations to causes, and being informed on what the issues are and how you can help. I hope that this post has given you some food for thought in terms of how we might continue to shape a distinctly American Druidry through the work of repair. The work in this post, I believe, is necessary if we are to deepen our own connection to the land and her spirits, but also work to get beyond the guilt of the past and work to actively remedy, as much as we are able, the wrongs that have been done. It is through this deep work that I believe we can cultivate deep–rather than surface–relationships with the land and especially with the spirits of the land, those who have been here for millennia. I also want to conclude by saying that I am under no illusion that the work I’ve outlined here is enough to repair all of these old wounds. I believe that that the full work of repair will take generations of people. But what I do believe is that someone has to pick up that work and start doing it, and that someone can be me–and perhaps you as well! When I was a child, my grandfather picked wild American Ginseng (Panax quinquefolius). I remember him talking about it, and seeing it, and him sharing with me what it looked like. To him, ginseng wasn’t a profitable plant to be harvested and sold, but rather a local medicine that simply helped raise one’s energy. For him, health was a serious issue as he had spent his whole life in a steel mill. This American Ginseng was family medicine, ancestral medicine, the medicine growing where we lived. As in many things in childhood, this memory faded away until I took up the practice of herbalism in my adult life. When I first became an herbalist, I hoped I could reconnect with wild ginseng and seek it out. I knew the general area that grandfather had found it in. I had no plans of picking it (knowing that it is severely endangered and on the United Plant Saver’s list). I simply wanted to meet this plant, this beautiful and hugely medicinal plant native to the mountains of my blood and birth. What I thought would be a quick search turned into a year, and that year turned into multiple years of searching. I expanded my search to many other locales in the Appalachians, always, seemingly on the hunt for the wild ginseng. I had mentioned my interest in finding Ginseng offhand one day to my father, and he said he hadn’t found any either. As the years went by, I kept looking, but not with the enthusiasm I had before. 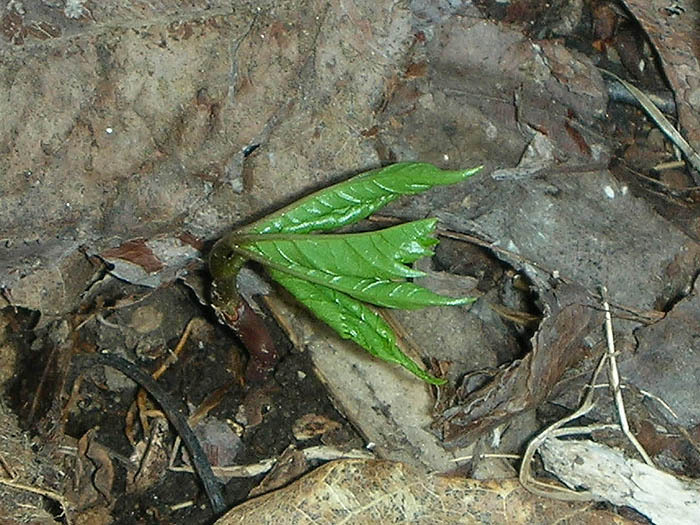 The lack of wild ginseng in any local forest really began shifting something for me–I began to be struck not only by what is here but what is missing, especially with regards to medicinal plants within their native range and native ecosystem (this is part of what prompted my wildtending series of posts last year). The experience saddened my heart and resonated deep within me. If I couldn’t find ginseng after so many years of searching, I had no business using it. Any other choice created additional demand. 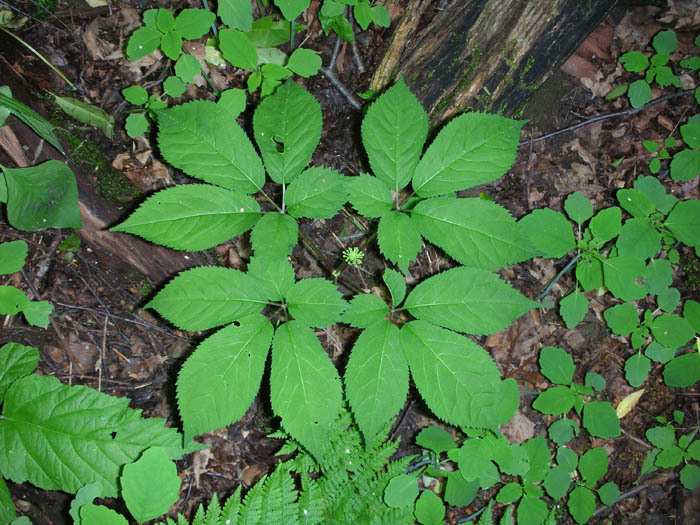 This meant that I was going to entirely avoid using the American Ginseng plant (and by proxy, most of the other rare woodland species also identified by the United Plant Savers: Blue Cohosh, Black Cohosh, Bloodroot, and Goldenseal). I wouldn’t’ recommend them, I wouldn’t use them, I wouldn’t teach them, and I would just “let them be” if they were to be found at all. I also grew skeptical of the “wildharvested” label for what it implied. Truthfully, I think a lot of us interested in medicinal plants take this “avoidance” approach, which seems completely reasonable. Because these medicinal plants are so endangered, the best thing we can do is avoid using them, let them be in the wild, and not put any increasing demand upon critical species. To use these plants, to source them, or to harvest them ourselves presents us with serious ethical dilemmas. But what I didn’t understand at the time was that this was not an either-or situation–there were some third options, and they are pretty good ones. A few years ago, my father, with a gleam in his eye, invited me back into those same woods where I had originally sought out the American Ginseng. He showed me his carefully planted patches of Ginseng roots and Ginseng seeds, little plots with sticks around them so he knew where they were. He pointed out their little red berries which he also carefully harvested and replanted deeper in the woods. In their third year of growth, some of the Ginseng Dad was growing developed a kind of root rot, so we harvested them, and drank some of the most uplifting and amazing tea you could imagine. My mother, who suffers from multiple sclerosis, shared how much better the tea made her feel. And these were the effects that pushed so many people, around the globe, to seek out ginseng for its health benefits. This was, honestly, the first time I had ever had consumed any ginseng and it was incredible. And it was ethically sourced, growing right there on the family homestead! Then, recently, I attended a wonderful workshop at the 2016 American Herbalist Guild Symposium put on botanist Dr. Eric Burkhart from Penn State University. Eric specializes in these under duress Appalachian woodland species, particularly, American Ginseng. At the beginning of his talk, he asked us how many of us used American Ginseng in our practices (and of a room full of 60 people, only 2 folks in the room did). When he asked, everyone shared reasons similar to mine above: they knew it was endangered, they didn’t want to create more demand, and so on. And he offered us some rationale and alternatives. What these two experiences did for me was offer to turn this binary into a ternary, allow me to have a more complex and nuanced understanding of the role of these herbs. Two experiences changed and deepened my “avoidance” perspective and encouraged me to see this from a permaculturist’s lens through “the problem is the solution” and the permaculture ethics. When people buy herbs, a “wild harvested” label is often desirable, yet, it has a very dark side. When it comes to American Ginseng, the wild harvesting is literally stripping the plant from our landscape. Currently, there is no policing being done on wild harvesting. 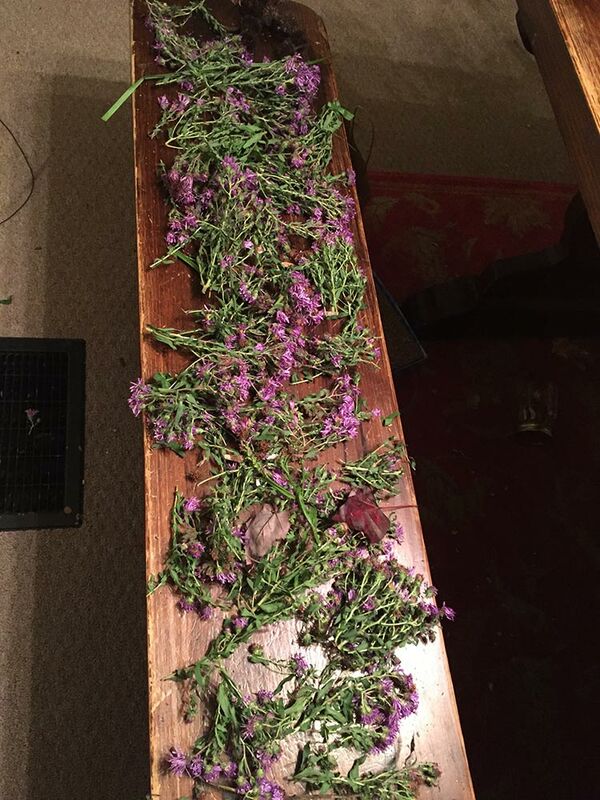 Eric Burkhart showed us screenshots from Facebook groups that show people harvesting–not only harvesting the wrong plants or look-alikes (in the case of Black Cohosh) but also reporting harvesting 100% of what they find. And with prices running hundreds of dollars a pound for American ginseng, a 100% harvest might be the difference between paying the mortgage or not for folks that have little other opportunities for income. Companies, regionally, pay top dollar to ship our American Ginseng overseas primarily to Asian markets. Here in Appalachia, we have an unfortunately long history of land abuse; it is to the point that stripping the land for profit is so common that other perspectives are simply not in the cultural consciousness. While there are likely some ethical harvesters out there, I don’t think there are many. And we have no way of knowing the origins of those “wild harvested” plants–there is a level of invisibility in these practices that makes me extremely and deeply uncomfortable. Since nearly all of these woodland medicinals are root-based and very slow to propagate, harvesting all of the roots means that the population of those plants is eradicated from that part of the landscape. Keep doing this, and we end up not having any left–which is about where we are at present, at least in the area where I live. I’ll briefly mention that previous cultures who depended on wild populations of plants, nuts, roots, berries, etc, worked hard to manage the health of those lands in the long term; to nurture them. This isn’t to say all wild harvesting is problematic–but I believe much of it is. There are many abundant plants that can be sustainably wild harvested (like goldenrod), carefully and with care. This is especially true if, as I’ve argued in this blog at multiple points, we give as more than we get–we combine wild harvesting with wild tending (that is, scattering seeds, sustainably harvesting only a little, and giving more back to the land than is taken). In fact, given the dire state many of our lands are in, I would suggest spending 75% or more of our efforts on replanting and wild tending and 25% of our efforts on harvesting as an ethical choice (but that’s an argument for a different post). Right now, I don’t think that’s what’s happening with a lot of plants, and so, the wild harvest label offers a lot of hidden problems–especially for root crops like American Ginseng. The avoidance problem, however, creates distance. It certainly did for me–I didn’t want to use these plants, but that also meant that I wasn’t cultivating a relationship with them. And I strongly believe that the key to responding ethically to the crisis of our present age, is in connection. As a druid who has helped others along their own spiritual paths, and as a human just living in this world, one thing is obvious to me: humans protect and value things that are of most use and sacredness to them. I’ve seen this in my plant walks–when I teach people about eating Autumn Olives or make wine from Dandelions for example, it completely changes their perspective. They go from being rather neutral about this abundant shrub or “weed” to being excited to see it, seeking it out, and enjoying its bounty. The problem, of course, comes in with our rare woodland medicinals–we don’t want people necessarily seeking it out and using it in the wild, especially on public lands where hundreds of people might be coming through. But we do want to build connection and value. The American Ginseng is ancestral medicine, it is powerful medicine that folks here aren’t even using. As Burkhart explained in his talk, nearly 90% of what is harvested leaves domestic markets bound for Asia. We aren’t even using the medicine of our own lands. So not only do we have a resource that we ourselves do not use, and know nothing about, it is being used by people far away who have no idea of the environmental toll that this is creating. I don’t think we can honor these plants through avoidance. And we certainly can’t honor them if they aren’t part of our lives because they no longer exist in our ecosystems. How do we turn this problem into a solution, ethically, and with a nurturing mindset? I think we are seeing the same kind of problem with rare woodland medicinal species that we are with a lot of other things: a good example is the meat/vegetarian debate. Factory farming is very bad and causes considerable harm and suffering. People solve this dilemma by going vegetarian, and that seems to be a binary choice: vegetarian or not. However, there are other options: raising meat yourself, working with farmers whose practices are nurturing, sustainable, and ethical, and maybe eating only a little meat rather than meat every day. These alternatives offer not one response (to consume or not to consume) but a range of responses (to raise oneself, to purchase from ethical farmers, to limit consumption). We can apply this exact same thinking to our rare woodland medicinal herbs. Reciprocation and Wildtending. 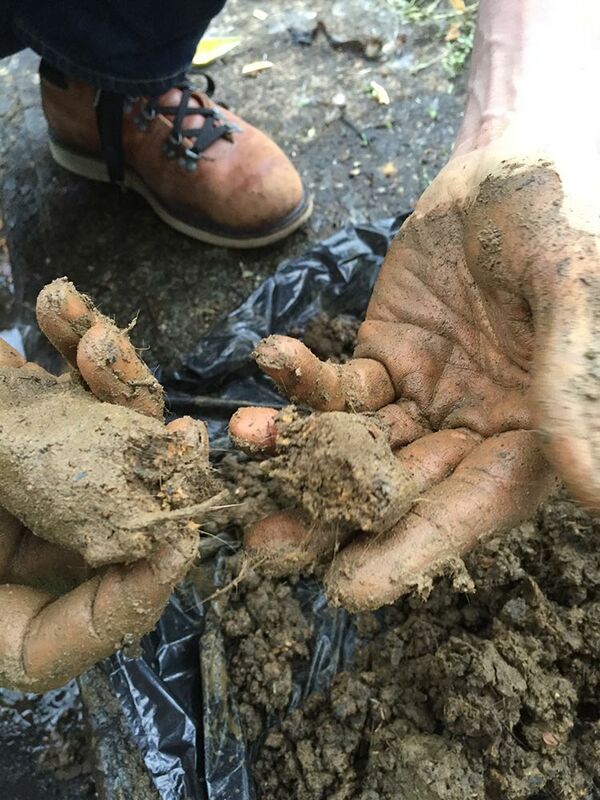 This brings me back to the example of my father–there was no Ginseng to be found, and we both knew it, so he ethically sourced roots and seeds from a PA sustainable farm (see below) and then started growing it. And now, my family has a small supply that is sacred to us, and that we can use understanding full well exactly what it takes to grow, how long it develops, and so on. We can manage the population in our own woods and make sure it is growing. For more on this, a great resource is a wonderful book (that I recently gifted my father) called Farming the Woods: An Integrated Permaculture Approach to Growing Food and Medicinals in Temperate Forests by Mudge, Gabriel, and Munsell. It offers a holistic view of how to cultivate and grow these sacred plants. I love this approach because it encourages both wild tending and helps us to balance those scales. But it also encourages us to cultivate a very deep and responsible use of these plants and re-establish connection. “Forest Grown” Herbs Initiative. A second option is to support those who are growing it ethically, to pay a fair price to those folks, and to learn how to use this sacred medicine responsibly. (By that, I mean extracting as a tincture and maximizing the benefit of these roots.) A recent initiative by United Plant Savers and Mountain Rose Herbs has led to the offering of “forest grown” Ginseng (available here). 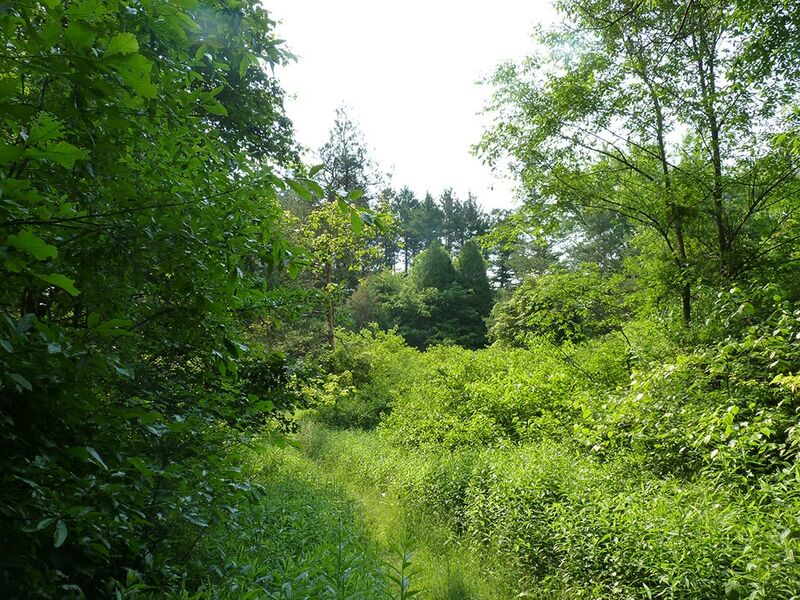 The Forest Grown Ginseng is grown without chemicals in forested settings where an emphasis is on the long-term health of the forest–using permaculture design and agroforestry at it’s best. These farmers do not stripping the land bare with wild harvesting–rather, this is a crop, along with others, that is cultivated in a forest setting, focusing on the health and overall welfare of the forest as an ecosystem. If we can create a market for these kinds of plants grown in healthful and nurturing ways, we can make sure more forest lands are used, and we can help put a stop to the wild harvesting/stripping bare practices we are seeing with regards to American Ginseng. Another issue here is that scarcity drives up the price; if more people are cultivating ginseng through the forest grown initiative, it makes it more affordable. 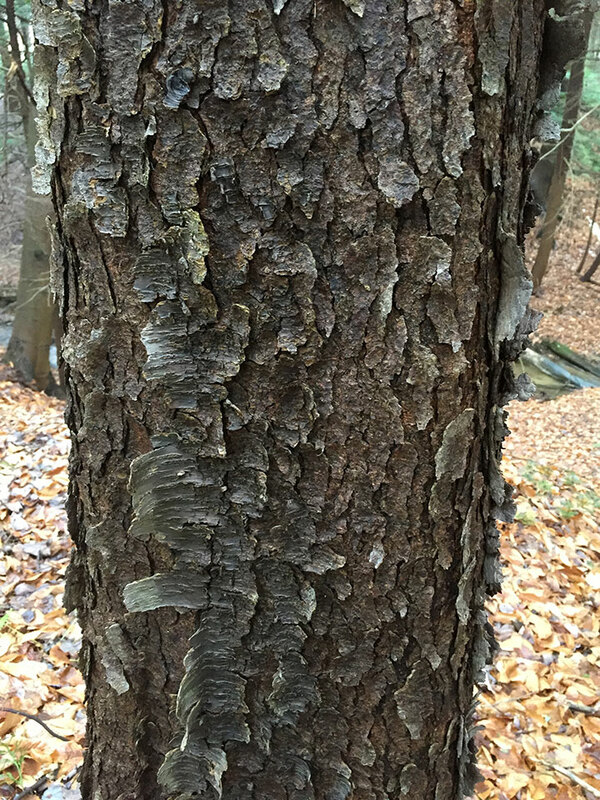 Agroforestry has incredible potential to leave our forest ecosystems intact and gain valuable harvests (shitake mushrooms, American Ginseeng, among others). Education. The problem with going to an herb catalog, or purchasing a powdered herb or tincture in a health food store, is that the origins and practices that produced that thing are completely invisible. And so, education and researching each plant and each company is key. Research the company who is producing it, research their sourcing–if the information isn’t clear, ask good questions. If possible, eliminate as many “middle men” along the chain and purchase what you need to purchase directly from small family farms or herbalists. I think that education can go a long way to helping us rebuild our own health and the health of our lands. With these alternative approaches, responsibility and connection are at the core of these practices. For one, the scarcity of the roots, and the amount of effort or funds it takes to purchase or grow them, means that we will treat them as the sacred medicine that they are, using them fully and effectively as possible with no waste. What I like so much about this expanded understanding is that it aligns so beautifully with the practice of permaculture design. In permaculture, the ethics ask us to consider how to care for the earth, care for its people, and engage in fair share all at the same time. These two alternatives do this: we can have powerful medicine that cares for people, use it ethically, and heal the land while doing so. We can cultivate deeper relationships with the living earth in all that we do. We can rebuild connections with the sacred medicines native to our region while protecting them for future generations and honoring them through all things. Recently, I went on a winter hike with some friends. It was below freezing, with ice-covered trails and the sun shining low in the sky. We came to a crossroads and all felt led to go to the left; eventually, we left the trail and worked our way down a steepish hill and to a beautiful cascading river. The river was incredible–the water had a greenish cast to it and it had so many layers of ice built up. We observed it a while, and then, I felt led deeper and closer, and following some mushrooms, went down very close. The closer I got, the more magical the river was–with ice castles, ice cascades, and a depth of color and energy not experienced in the summer months. A return visit in the winter would reveal a completely different river due to the ever-changing ice and snow conditions. Each winter visit, the, allows for a brand new experience as the winter snows come and go. This, dear readers, is the hidden beauty of winter, the dynamic quality and ever-changing nature of this dark time of year. It offers a beauty well worth seeking out. I think that most people’s reasonable reaction to the cold and snow is to hole up for wintertime, waiting till the sun and warmth returns before going outside for hiking and such. However, winter has always been my favorite of the seasons for its dynamic and magical nature, and with careful preparation, can be enjoyed like any other season. 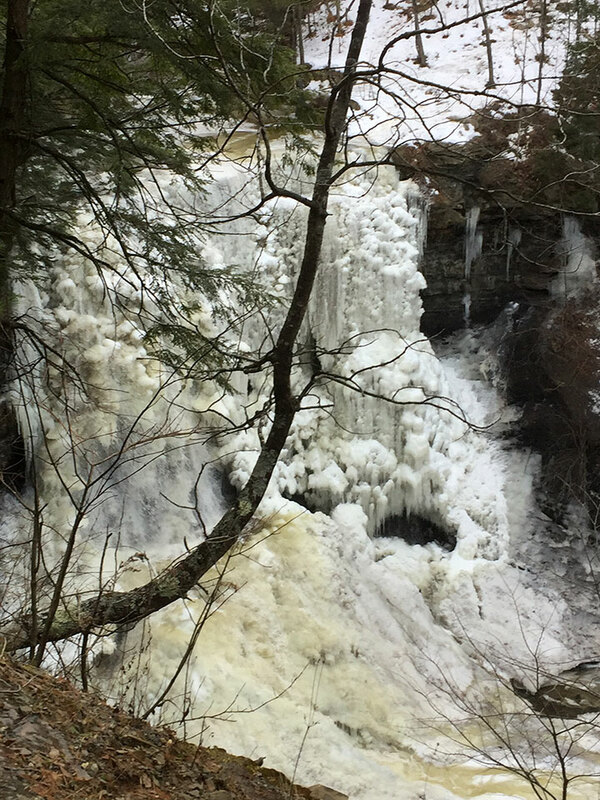 Taking a hike in the woods during the winter months, especially visiting local waterfalls and streams, offers an array of beauty, stillness, and intensity simply not often found during the summer months. Winter offers us plenty to see, plenty to do, and certainly, plenty to learn–and here, on Imbolc in early February, we are in deepest part of the winter months. In fact, I can’t enough of winter hiking and find myself out as often as possible! This post explores some simple ideas for taking a walk during the winter months and getting the most out of the experience; I’ll explore clothing, footwear, and gear; timing and safety; winter botany and foraging; tracking; fun things to do; and more. 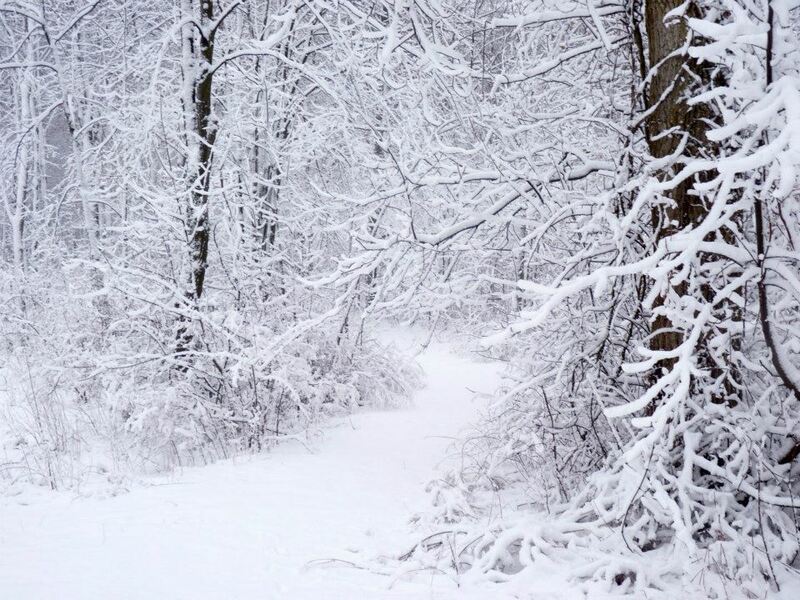 So join me on a walk into the winter wonderland! One of the things that people don’t always understand today is how to properly outfit themselves for a winter hike. Proper clothing and footwear ensure that you have a great time rather than a cold or dangerous one. You can do this with minimal special equipment and investment. Clothing: Clothing is important–you will be out for an hour or more, and it is not the same as a quick walk from the house to the mailbox or out to shovel snow. I advocate for natural fibers (particularly wool) and layers of clothing on the body. Two pairs of thick wool socks, good boots (hiking or snow boots, depending on the depth of the snow), gloves (for extreme cold, I will put a thin pair of gloves inside my warm woolen mittens), a wool hat, wool scarf, and good outer jacket are necessary. For pants, insulated pants, snowpants, or several layers, including preferably a wool layer, are good. The idea is that you can strip off layers of clothing as you heat up–and walking helps keep you warm. Footwear. Footwear is critically important, even for short hikes. You can go far with a good insulated boot with good traction or a hiking boot with gaters (gaters are a kind of leg warmer that insulates the lower leg and keeps snow out of the boot). I actually hike most often in the same boots I do in the summer, just with an extra pair of socks. Winter Traction. Winter conditions, especially in this time of warming winter weather, often create ice. I used to have to wait till there was good snow or things had melted, which really limited my ability to get out and about, even with good hiking boots. Then, I recently discovered the incredible world of winter traction devices, and it has really opened up my access to the hilly and more icy trails in Pennsylvania! The right treads make even the more treacherous of trails really passable and enjoyable, and open up a lot of opportunities for winter hiking, so I’d strongly suggest investing in some or making some if you can. 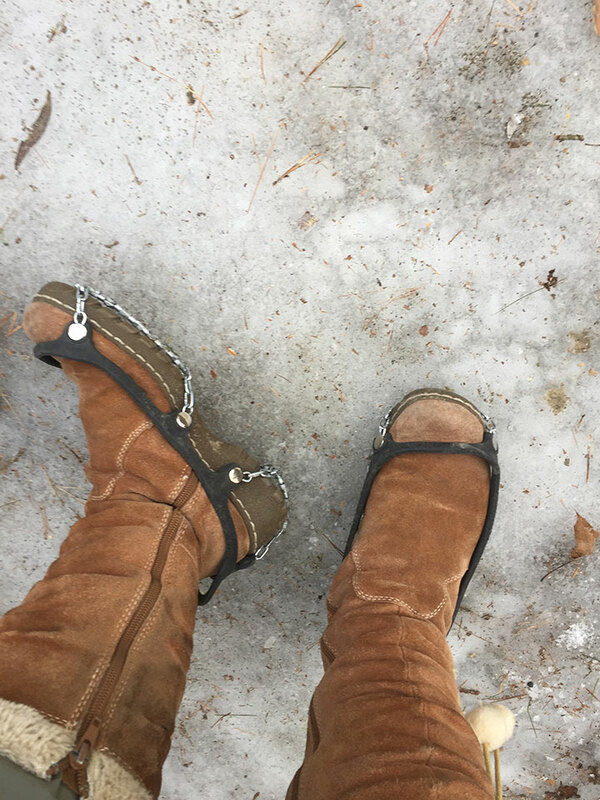 With the treads, I can walk (or run) on even the most extremely icy of conditions with stability. A lot of folks add some ski poles or a walking stick for added stability. Snowshoes. I haven’t had the opportunity to snowshoe (due, primarily, due to decreasing snowfalls and very small amounts of snow in the winter months), but this is certainly another possibility for you. Since I don’t have a lot of direct experience, I’ll direct you to sources who do. Water and snacks. Winter hiking still can work up a good sweat and appetite; just as in the summer months, it is a good idea to bring a water bottle and snacks if you’ll be out for a bit. Miscellaneous supplies. A small first-aid kit, a compass and map, fire-starting equipment, a foraging knife–these are things that are good ideas for any hike, and winter hikes are no exception. I often also bring a backpack for gear as well as to shed any layers I might want to be rid of if I get overheated. A Friend. 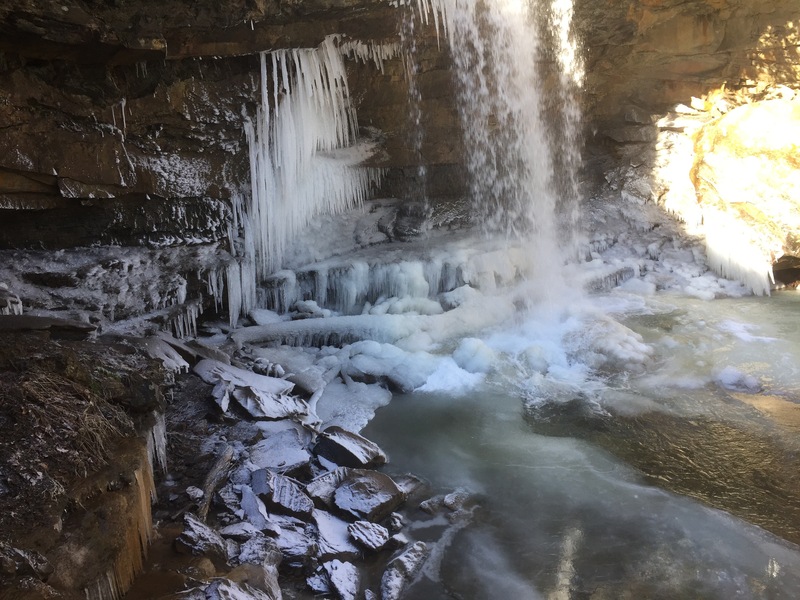 Winter hiking can offer challenges that summer hiking does not–even with the best traction shoes, falling into a river, for example, can mean serious harm to your person. It is for this reason that I strongly advocate always having a hiking buddy with you. One of my dearest friends with me out on a winter hike! The timing in winter matters. Each moment of winter, each day you go out, offers a different experience. I would suggest getting out as often as you can. If you are driving somewhere to do a hike, you want to make sure you are able to make it there and back safely. 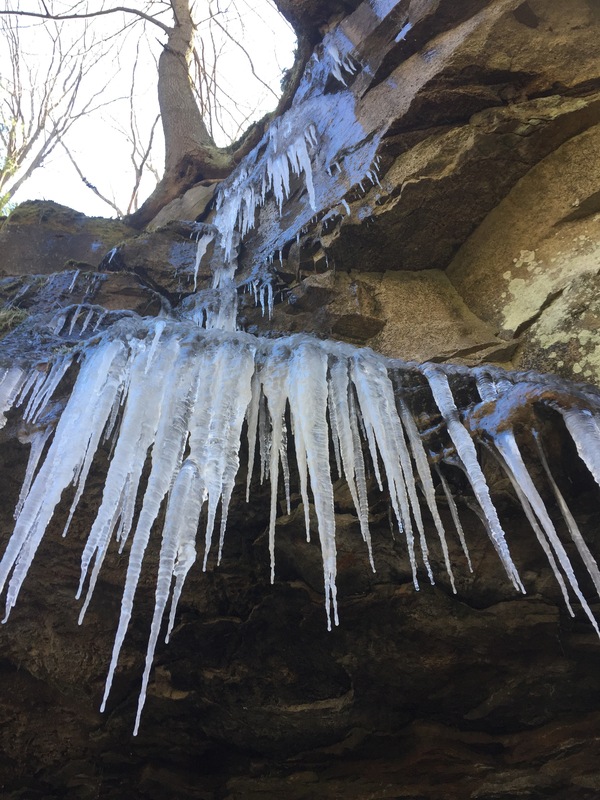 Staying Close or Going Far: It is for this reason that I like to plan hikes in state forests and the like on sunny days or days it won’t be precipitating and plan hikes completely on foot on snowy days or days with winter storms. Interestingly, with the right gear, I have found it much easier and safer to walk on the snow than to drive on it! Snowstorms: As the snows begin to fall and lay on the landscape, you enter a different land. The quiet dropping of the snow, and the stillness of it all, bring a quiet to the landscape rarely present any other time of the year. I love taking it in while it is happening and enjoying walking out in the storm. End of the Storm: Go out as soon as the storm is over–the dynamics of winter mean that nothing will stay the same for long. I remember one day in Michigan when everything was just covered with a powdery snow–every branch of the tree was accentuated and it was magical. About an hour later, the winds picked up and everything changed–I was so glad I took my camera out that day! Icestorms: If you have the really good treads, the ice storms too can be really delightful to go out in. The treads make it so you are stable even on inches of ice, and for that reason, you can go out and observe what is going on! Because nobody else goes out in an ice storm, and even walking around your yard or neighborhood, again, offers tremendous experiences. Winter offers a range of opportunities to deepen nature awareness and spend time getting to know the living earth in all of her seasons. Tracking: Animal movements, tracks and trails are really easy to observe in the winter months. I remember the first winter I had spent at my homestead. I had been trying to figure out the path the deer were taking, and then when our first snow hit, I clearly saw their trail in ways it was difficult to see before hand. I discovered the raccoons who had been visiting my compost pile, and some critter living in my barn (who I later discovered was a possum). While I had glimpses of these animals in the summer, the winter offered much more opportunity to see all of their movements. I followed the deer trail deep into the woods and came to a natural sacred grove there, which was an amazing experience. This is all to say that you can track animals extremely easy and build your tracking knowledge over time. 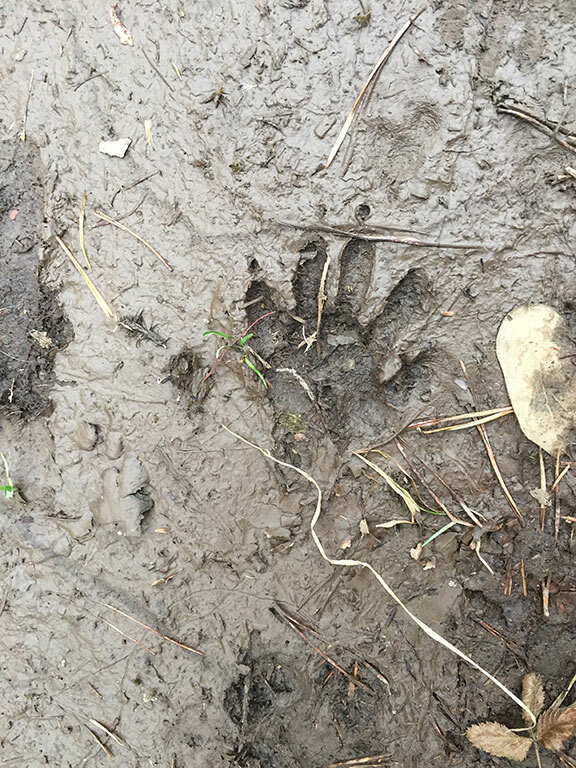 A good book to learn tracking is Paul Rezendes Tracking and the Art of Seeing: How to Read Animal Tracks and Signs. 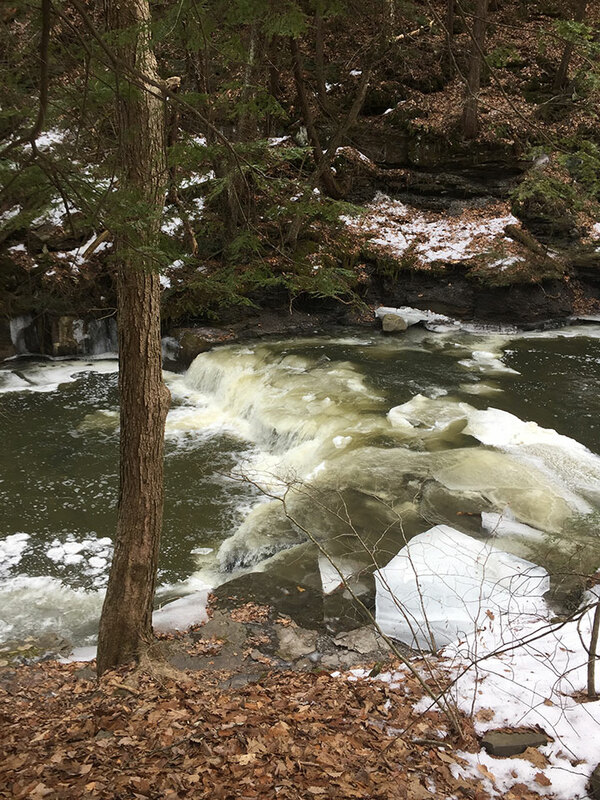 Seeking Waterfalls, Creeks, and Rivers: One of my very favorite things to look for and to hike to in the winter months are moving sources of water. 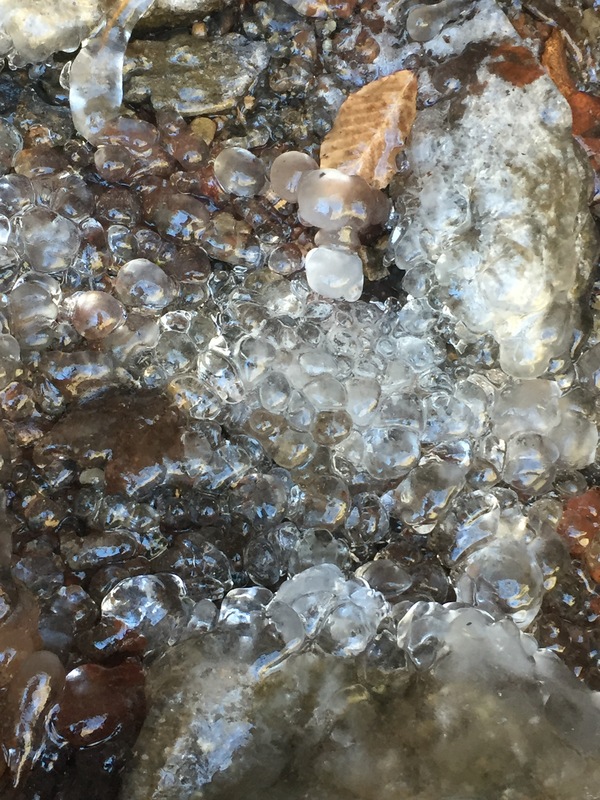 These are incredible–each day, the river changes with the temperature, sometimes being very clear and deep, other times (when it gets bitterly cold) freezing up. They are always well worth your time to travel to (by foot or by vehicle). I like to meditate there, and if possible, explore them from multiple angles. You can learn a lot about the sacred lessons of water from the flows and movements of the interplay of snow, ice, and water. Winter Tree and Plant Identification. 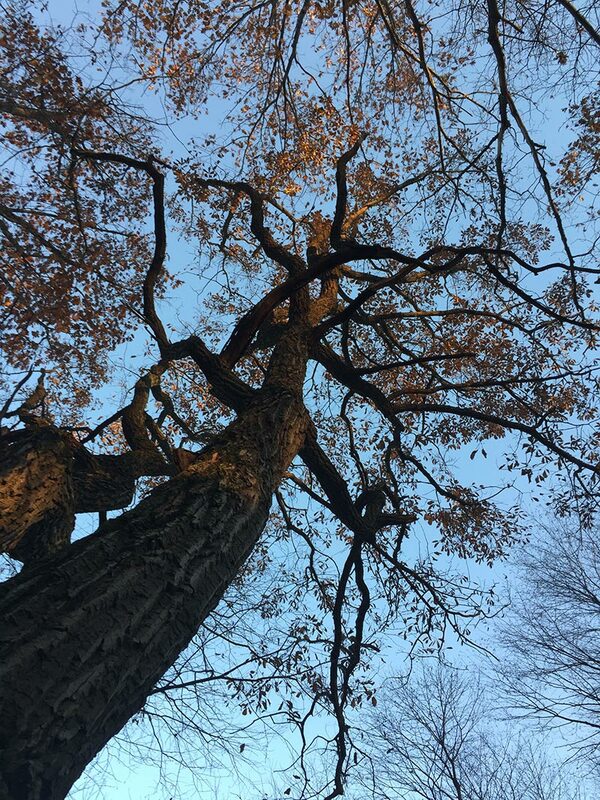 Winter offers us an amazing opportunity to learn how to identify trees by their bark and the shape of their buds and branches (or studying trees that you already know and observing their bark and branches). Another useful thing to do is to look at the dead or dormant plants growing–what do you recognize in a different form? Whose dried seed pod is that? For this, some good references for my bioregion include Winter Botany: An Identification Guide to Native Trees and Shrubs by William Trelease and Bark: A Field Guide to the Trees of the Northeast by Michael Wojtech and Tom Wessels. Mosses and Lichens. 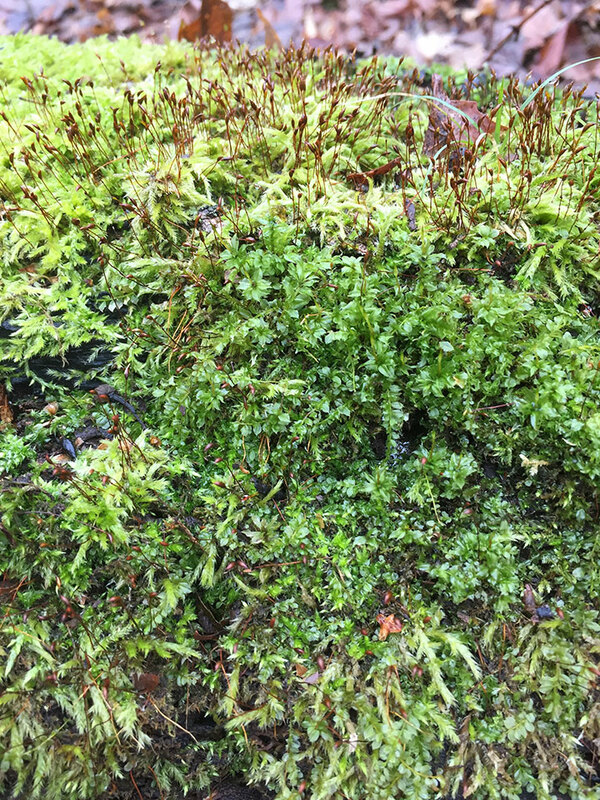 Moss and lichens are really interesting to observe in the winter months–in a forest, the moss and lichens take advantage of the openings and light to do a lot of growing. I have been on hikes that have abundant, bright green moss in late December when the moss is just bursting with color and life. Mushrooms. 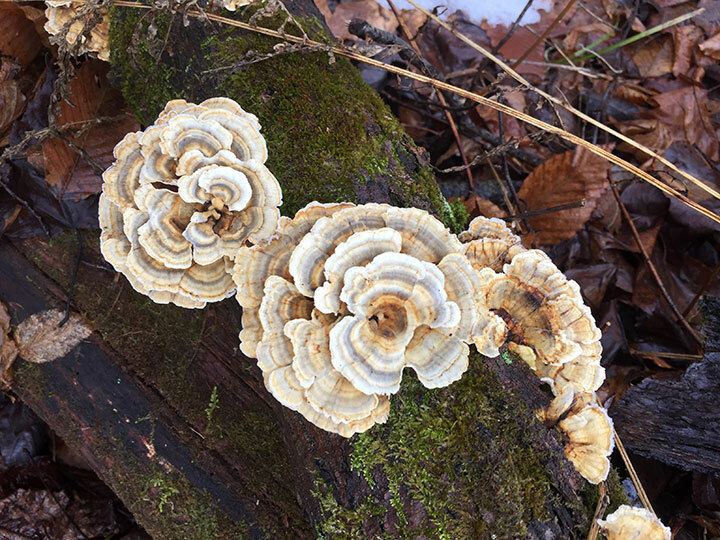 On the edges of winter or in particularly warm times, mushrooms (including oyster mushrooms, some of my favorite) are also good to look for. Oysters can grow when its quite cold and offer a tasty meal. Lots of other mushrooms will pop up as well–so be on the lookout in those warmer winter moments. Foraging. Some limited foraging and wildcrafting can be done in the winter months and in fact can be done better then than other times. Pine, spruce, and hemlock needles make a wonderful nourishing and vitamin C-filled tea. This is also a really good time to look for tree resins (see my post on tree incenses from last year). Nannyberry (Virburnum Lentago) can persist in the winter months, and you might find yourself a wonderful trailside snack! I gather certain materials for making handmade paper (like cattail heads) or other goodies during this time of year. (I’m working on some natural panflutes now and just harvested the materials two weeks ago). If you are doing any natural building using thatching, for example, phragmities (reeds) can be harvested in abundance easily this time of year. In other words, the forest still offers abundance to those who know how to look. 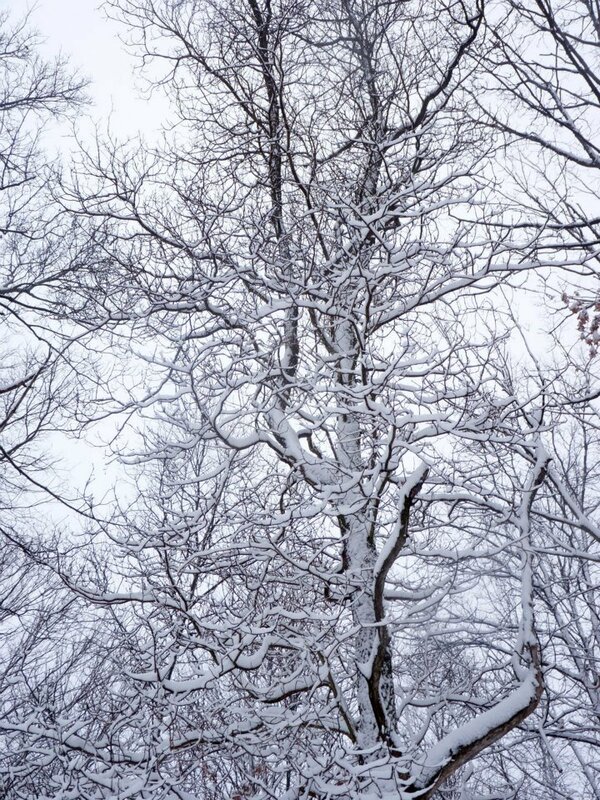 Beyond communing with nature and learning more about her, there are many fun winter activities to do in the woods. Follow a Deer Trail. Trails made by humans offer pre-determined destinations. This is why it can sometimes be fun to get lost in the woods (but only if you can safely make your way back again–use trail markers, a compass, etc). One way of getting “lost” I rather like is following a deer trail and seeing where it leads. This is nature’s version of your hiking trail, leading you off in new directions. Make some spirals in the snow. I wrote about this in a post on winter last year–you can create spirals in the snow and walk labyrinths for meditation and deep healing. This is a very relaxing activity, and one I like to do as part of my celebrations of Imbolc each year. Enjoy a meal or cup of tea. A simple thermos with a steaming cup of tea can make for a simple winter ceremony or quick way to warm up. Recently, a friend and I were in search of waterfalls, and I had made a Chaga tea with maple, and brought it with us in a thermos. There was nothing quite like sipping that chaga tea while sitting by the waterfall, observing it in all its amazing beauty! Every once in a while, a rainbow would form of the frozen mist–and had we not been enjoying the tea, we may not have stayed in the same place long enough to see it! A second really fun thing to do in the winter on longer hikes is bring a little camp stove (the backpacking kind) and/or forage for kindling and start yourself a small fire for a pine needle tea (see below) or heat up some grub; this is a great way to enjoy winter and warm up a bit. Of course, as part of this you might want to either bring something to sit on (a little foam mat works well, like a gardening mat) or you can use leaves and/or some boughs from a fallen pine to allow you to sit comfortably in the snow. Winter Frolicking. Enough good can’t be said of winter frolicking in the snow. This takes on different forms: sliding down the hill in a sled, making snow angels, dancing around, throwing snowballs, and more. Seed Scattering. Many seeds require a period of dormancy and freezing before they can germinate. I like to scatter seeds using a “frost seeding” technique in the winter months. This technique is based on when the ground has been very wet, and then freezes, and the frozen earth rises up with the water; when you step in it, you’ll get pockets and a lot of crunching. If you scatter seeds when the ground is like this, when it thaws out, the earth will return and the seeds will be buried. So its a great time to do a little wildtending. I hope that this post has inspired you to go out, get on some trails, and enjoy winter in all of her splendor. 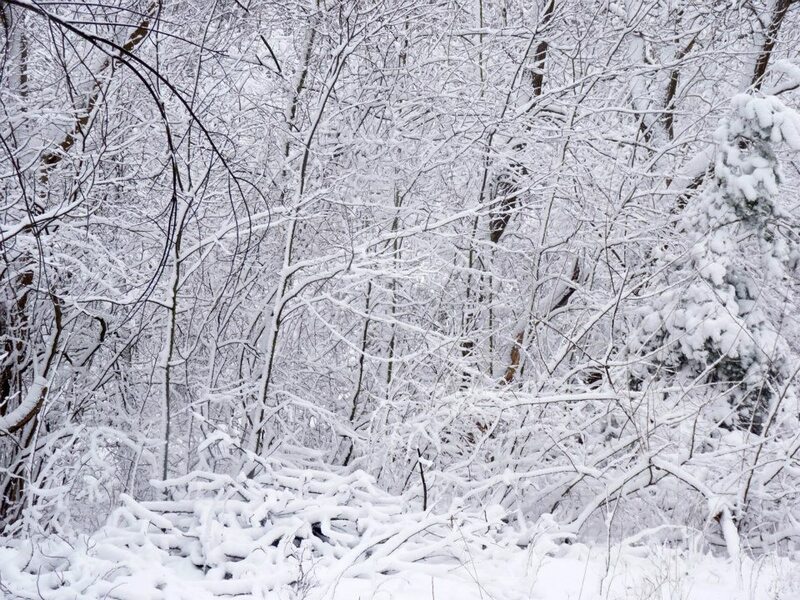 Imbolc is a wonderful time to do this and learn about the depths of winter and her many mysteries–and I’d be delighted to hear any stories you have about winter hikes! As I grow ever more in tune and aware of nature’s gifts, I keep coming back to one of the tragedies of our age–our incredible misunderstanding of the natural world, the sacred living earth from which all things flow. 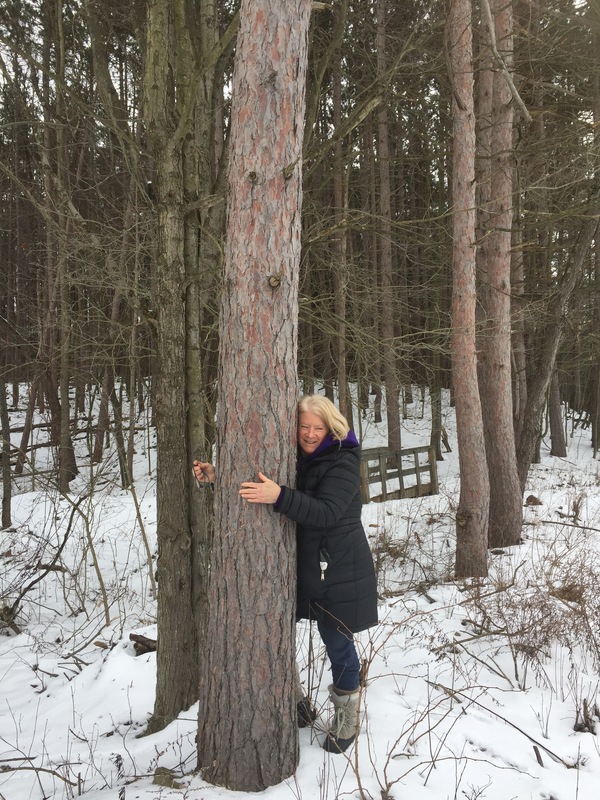 One of the things I’ve been working hard to do in this blog, and in my own community here in PA, is to restore and reconnect humans and nature. My particular way of doing it has lately been through the teaching of healing plant medicine, edible wild foods, and the like. This means breaking down some assumptions, but really, building new knowledge and empowerment for many people in the community. Since moving to my small town I’ve been really busy as an ambassador offering presentations on permaculture and vermicomposting, summer plant walks (wild food/medicine), herbalism classes, and most recently I am teaching children at the local UU church how to make medicine from plantain! I am finding that here, there is a great need for this kind of plant education in the community, certainly, and great interest. What I am learning is that people have very limited vocabularies, frameworks, and understandings when it comes to plants. One of the things that often comes up from people, and that they latch onto, is the idea of the “invasive” vs. “native” plant. When I share a plant, they want to know if its invasive or native, and I rarely want to use those terms. As I mentioned in my last post on this subject (which was rather controversial), the concept of invasiveness is, in itself, a real problem. And I think, more than anything, it is because all invasive plants are put into a little box. If these plants were human, attaching such a label would be considered racist, sexist, classist, homophobic, etc. But apparently, we can do it as much as we like to plants–and when we pigeonhole plants into an “invasive” or “native” category, we make assumptions about them without knowing their true nature, understanding their spirits, or their medicine and magic. I think this is a problem for a number of reasons. For one, the term is derogatory, and makes a set of assumptions that simply don’t fit for all plants with the “invasive” category. Second, a lot of plants don’t fit in the whole binary very well. Poison ivy, which is one of my very favorite plants (I will have to write on it one of these days) is a native plant, yet, it doesn’t get privileged status because humans don’t like what happens when they rub up against it. Water hemlock is another native plant which which you do not want to tango. Nearly all lawn grass isn’t native, but humans like it because it mows well and mats well and creates lawn. We have all kinds of stuff we’ve planted (hello wheat, oats, barley, lettuce, onion, radish, leek….the list goes on and on). How do any of these fit within the categories? They really don’t. So if the categories don’t fit, why do we still use them? Probably because they are simple, and they allow people to know something (e.g. plant = good or plant = bad) about the plants. Part of what I believe we need to do, in order to build more fruitful relationships with nature, is to rethink these terms. So today, I’d like to present one new category that we can consider as a thinking, teaching, and relationship-building tool: the first aid responder plant. Imagine that a person who is in a really bad accident, that the person was unable to move, damaged and broken. Who would that person want to come to their aid? A first responder, that’s who! An ambulance and medic, someone who could help stabilize the person, get them to the hospital, and set them on the path for long-term healing and recovery. If we use this same analogy with plants, we can see that this is what happens to our lands every day. I wrote about different kinds of damage extensively in my recent land healing series. Our lands are harmed with our various activities: oil extraction, logging, new construction, conventional agriculture, and so on. These activities really harm certain kinds of plant species that are slow to propagate and slow to take hold. But other plant species, those that have evolved to adapt to these kinds of conditions, can take hold and help regenerate the land. They are plants that are adapted to particular circumstances: disturbance, and the nature of that disturbance is almost always human caused, directly or indirectly. And these are our first responder plants. Unfortunately, a lot of our first aid responders end up on noxious weed lists for a simple reason–they are abundant, as disturbance is abundant. This has people assume immediately that these plants are somehow “out of control” but, given the nature of where these plants grow, they are only responding to human-caused disturbance. As I’ll show here, the situation is far less clear. For one, people only pay attention to what is happening at this moment, not what has happened or what will happen in the future. This short-term view means that we cannot account for most of the variables in why the responder plants are here–and that’s a problem for a few reasons. Ox-Eye daisy is a very good example of a first-aid responder plant (and delicous edible and medicinal plant). This plant often shows up in disturbed soil: over-grazed pastures, old potato fields, edges of parking lots, and so on. People see these dense patches of daisy and think, “oh noes! There’s the invader!” without paying attention to why it is growing there or the history of the land. I observed a very interesting pattern with regards to daisies in my own acre-sized field on my homestead: the first year, the field was all daisy, as the previous owners mowed the field all the time. I chose not to mow the field but instead only mow walking paths; the second year, the daisy only grew on the paths where I had mowed. 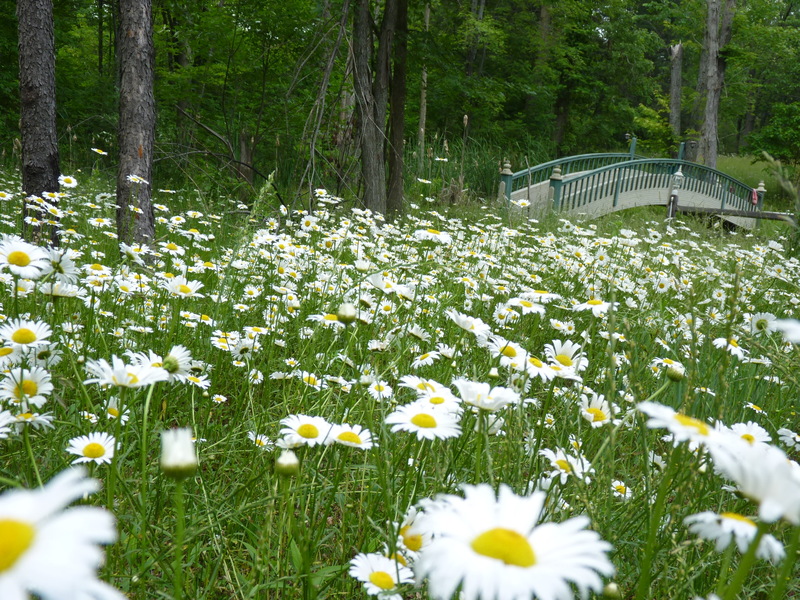 By the fourth year, there were very few ox-eye daisies other than growing out of the paths–the rest of the field had gone to milkweed, st. john’s wort, wild strawberry, and other such plants. The truth is, you aren’t going to get rid of Ox-Eye daisy in a field–but you don’t need to if you let it do its sacred work of healing. Ox-eye daisy my first year – this field has practically nothing after six years! Sweet clover is another one where I’ve seen a similar pattern–areas of disturbance, especially areas that have been recently dug and mowed. I noticed this a lot in parks–fields of plants with sweet clover only on the disturbed edges. If there is no longer disruption, it disappears after about five years (fitting my first responder category). Bees make incredible honey from sweet clover, and it is also a fantastic medicinal plant, particularly indicated for nerve damage. Dandelion is yet a third fantastic first responder plant; and I’ve written on the dandelion’s magic and purpose extensively a few years ago on this blog (along with wine recipes, lol). Dandelion breaks up compacted soil and brings nutrients from deep. It is particularly effective in regenerating lawns. 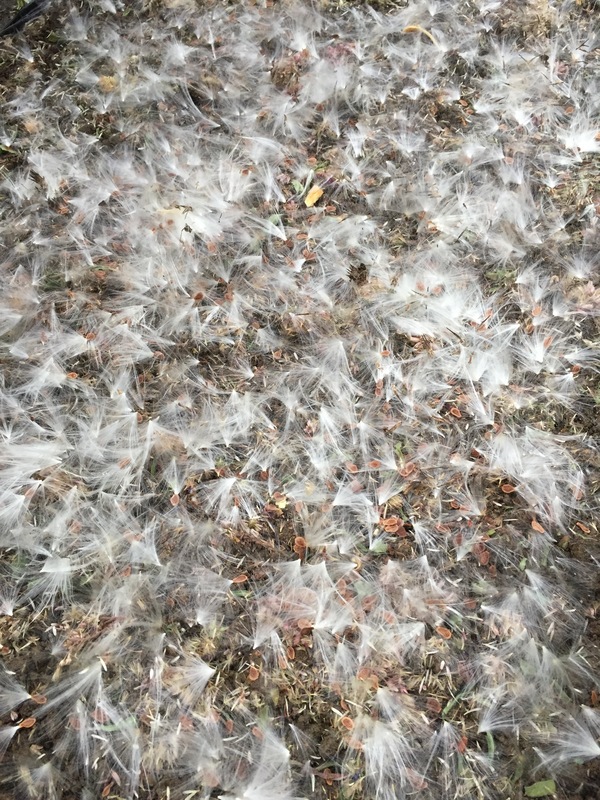 Dandelions won’t grow once ecological succession happens and the lawn is no longer a lawn–again, they are a first responder plant. And, of course, dandelion is medicinal and edible. 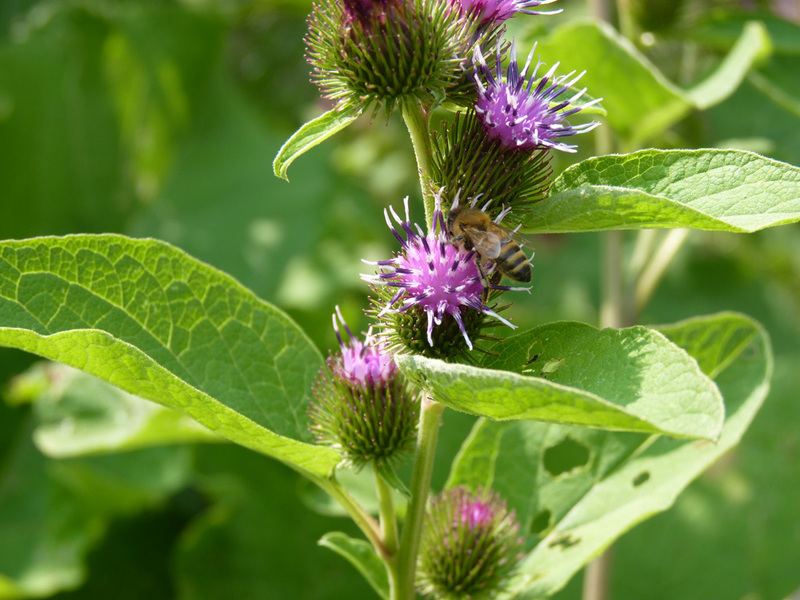 Spotted Knapweed is yet another first responder, and one my herbal mentor Jim McDonald taught me extensively about. Jim showed us his field that used to be full of it. The more he pulled, the more it came (of course it did, it thrives in disturbance). He gave up pulling it out and over time, it did its work and now there isn’t hardly any of it left after about 10 years! And, if you are noticing the pattern here, spotted knapweed is also medicinal. Curly Dock/Yellow Dock and Burdock, which are both fantastic medicinal and edible plants, also work with compacted soil well, and will grow to heal disturbance and break up compacted soil if given a chance to do so. Once ecological succession takes place, curly dock and burdock are nowhere to be found. What you have hopefully noticed form this list is not only is this plant a first aid responder for the land, these plants are also healing and medicinal for humans! We should be thanking them for the services we provide for our lands: healing the soil quickly and effectively, breaking up compacted soil, reducing erosion, offering us medicine and food so freely. These plants deserve our respect and to be honored. Where would the land be without these first aid responders? Where would we be without them? I hope this framework is helpful to you as a way to expand beyond the invasive/native binary. Now, I am full to admit that this is one taxonomy of plants, and there is another group (kudzu, buckthorn) that may rightfully deserve some of the ire that people throw at them (as these vines literally tear down forests; the long-term ecological impacts still yet to be known). I cut buckthorn down by hand when I see it, for sure. But I don’t think by any means that the first responder plants deserve to be in the same category, not from all of my observations and research. And maybe, next time you see one, thank a first responder plant for the good work that plant is doing on behalf of all. PS: This link tells you a bit more about how some first responder plants indicate certain soil conditions. Alternative Front Yard full of healing and habitat! As I walk through my neighborhood in this quiet Pennsylvania town, I am struck by the contrast. On one hand, many of my neighbor’s lawns are monocropped with grass–one after another, green expanses stretch on and on. Dandelions are quickly sprayed, and uniformity reigns supreme. This is the language of “progress,” the look of industrialization, and the announcement of humanity’s dominance over nature. But yet, on many blocks, one or two households have embraced a different paradigm: kale and strawberries along the front green area between the street and the sidewalk growing for any who want to harvest, pumpkins climbing through hedges, a completely alternative lawn full of herbs that requires loving care, but certainly not mowing. A fully abundant 1/10th of an acre with fruit trees, raised beds, grape arbors, and beautiful carved wooden sculptures. This is a sign, to me, that change and hope are possible and that the language of healing, the language of regeneration, touches the hearts and souls of so many here. Part of this is facilitated by community groups: this town has held an Herb Study Group for over 30 years as well as an avid group of gardeners, and alternative lawns and growing spaces are accepted here (although still not the norm by any means). The contrast between these two spaces, both energetically and physically, is quite impressive. And this isn’t the only kind of regenerated space you can find nearby: after the strip mines complete their work, they are now required by law to return the landscape. Usually, this means planting scrub pines and watching the goldenrod come back in with very limited biodiversity, but occasionally, you find a druid wandering among those places, spreading magic seed balls infused with the energy and light of healing or planting nuts in the bare soils–and the seeds of biodiversity that can help this land transform and regrow the many things that were lost. Now, new ecosystems are being reborn in those places that were once stripped bear. And, a place I’ll be visiting this summer to do some backpacking is the PA Wilds region, an area with almost 1.5 million acres of forests. These forests were once desolate, logged areas, with almost 100% of the forests being clear cut about a century ago, much of the logging to fuel industrialization and expansion. While these forests are still under threat from fracking and oil exploration (especially in the Allegheny National Forest), many of these lands are regenerated with abundance and life. Even wild elk roam once more! Truly, as a land healer, being part of spaces that can be, or are being, actively regenerated–and healed– is my favorite kind of work. I say it’s my favorite work because the other work I’ve talked about, in the last four or so posts in this series, where you are witnessing, holding space, sending energy deep into the heart of the earth is all really hard–energetically hard, emotionally hard, and can be physically draining. Its even hard to write about it, which is part of why this has taken me so long to finish what I thought was going to be a short series on the subject! But the work of regeneration, of taking damaged lands and helping them heal–the work of this post: it is work that regenerates the spirit. It grows as you grow, it unfolds and you unfold with it is perfect harmony. This work allows us to share our gifts of creativity, nurturing, healing, and joy and reconnect with the living earth around us. I’ve really been talking about this subject of land healing seriously for over a year now from different angles, especially focused on the physical regeneration of the land through my posts on healing hands, on refugia gardens, on seed saving and spreading seed balls, on alternative front and back lawns, and even further back on homesteading and my own regeneration work in Michigan. As you can see, I’ve written a lot on this blog about physical work of land healing as spiritual work, and I want to talk today about the linkages between the physical and spiritual dimensions and the more energetic aspects of this work. Because while the land always has the power to heal–energetic work on our lands can help it heal much, much, faster. Consider this like a burst of healing energy to get the land abundantly growing again! This is, for now at leats, the final post in my Druid’s Primer for Land Healing series, although I do have some more specialized topics planned in the future. You can read the full series of posts here: Part I, Part II, Part III, Part IV, Part V, Part VI, Part VII, and Part VIII. And once you’ve done that, come back, and we will talk about how to heal our lands! I want to return to my very first post in this series briefly, and remind you about the places and spaces that land healing–land regeneration–can happen. 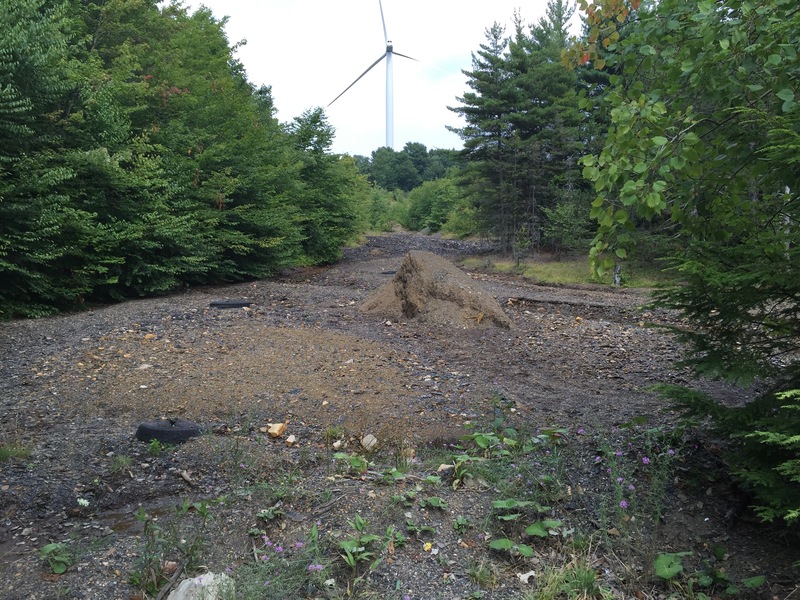 This direct healing work should be done not on sites that are actively being damaged outside of your control (repeated logging, strip mines, etc)–this is the work of palliative care, and I refer you to earlier posts in this series. Nor is it the work of a site that is going to be destroyed–this is yet another kind of spiritual and energetic work. Today’s work is for sites that have had damage (whether it is that the ecosystem has been removed because of construction, mining, or even replaced with a lawn) and is in a place that it can now heal again and is free from possible damage in the immediate future. This is really an important distinction to understand, because the wrong kind of energetic work can be damaging. Here’s what I mean: a lot of the techniques I will describe in this post are techniques of the energy of spring and that of fire–its about waking up, getting things flowing again, coaxing the spirits of the land out of deep slumber and hiding. The last thing you want to do is do this work if the land will end up being destroyed so soon again. That’s like rousing a sick person out of bed, and moving, when all they really need to do is sleep through the worst of it. If the land has been damaged for some time, the spirits of that land may have fled, gone deeply underground, or are otherwise closed off. I experienced this on my land in Michigan when I first arrived. I remember standing beneath the giant white pine tree, next to the second white pine stump that was it’s partner and had been cut off haphazardly by the previous owners. I sensed the spirits were there, but there was tremendous sorrow, anger, and resentment of all that had been done to the land. I began, before doing any healing work, with the work of apology and witnessing, acknowledging what had been done and showing that I was a different kind of person and was here to help. I don’t think, at first, I was accepted as someone who would heal. And so, I my waited, knowing that things would unfold in their own time and in their own way. The only thing I did during this time was clean up active piles of garbage (like a burn pile) and scattered debris, and then I enacted the first design principle of permaculture: observe and interact. Time for some regeneration! This is one site I’m working with at present. Shortly after I moved in, a racoon that had distemper showed up in my yard in the early morning hours. The racoon was out in the day, and after I determined that he didn’t have rabies based on his symptoms, I sat at a distance, holding space with him, knowing that his time was near. He passed a few hours later. I dug a deep hole, blessed it with flowers and sacred water, and had a small ceremony for him. I covered him up and piled a cairn of rocks quite high, knowing that if his body was left out, the disease would spread. Sure enough, over the next few days, a number of critters tried to get into that hole, but were unable to do so due to my careful burial. The distemper was stopped from infecting any other animals. After the raccoon incident, the land opened up, and the actual healing work could begin. I realized that the raccoon was a test, and apparently, I had passed. It was at this point that the spirits of the land spoke to me, shared with me the healing work that was to be done, and I began in earnest. I will also say that that wasn’t the only test, and they come at unexpected times! No single person’s approach is the “right” approach to land healing work. You may have a very different skillset or background than I do, so I would suggest that you take the approaches here and use the ones that work for you (and I am very interested in hearing approaches you have used–please share!) I would also really strongly encourage you to bring others in for the healing work. For example, my sister is a Reiki Master Teacher, and the way she moves energy is very different than the ways that I do as a Druid. It was a welcome thing for her to come, after I purchased my land for example, and do her own kind of energetic healing. Another friend was an incredible musician, and radiated his healing energy out to the land with a series of wonderful folk songs. And so, you might think about the land healing work you do like a colorful patchwork quilt with different designs: many approaches can work, and the more, the merrier! So with that, here are some that I have found particularly effective. The most important aspect of all of this work, whether you are doing music, reiki, ritual, or other sacred work that I describe below is that you understand the relationship between physical healing and energetic healing. You might think about this in an analogy with human beings: we have a physical body, we have emotions/heart, and we have a soul. These are all interlinked, and yet, each needs a different kind of healing energy. Our physical regeneration of the land, through tending the wild, scattering seeds, replanting and regrowing, is like the physical regeneration of our bodies. This is building habitat, reintroducing species, creating spaces for life. The energetic regeneration is a lot like helping heal a person’s emotional scars: this is a completely different kind of healing, done by different strategies or even a different kind of healer. This is rebuilding the human-nature connections that have been severed, reconneciton, rebuilding trust. The healing of the soul–is like the deep spiritual work we do as humans. I tie this analogy to that of the spirits of the land, those non-corporeal beings that reside in our lands and make magic there. River spirits, tree spirits, larger guardian spirits, animal spirits, plant spirits–so many live in our lands. It is on all three levels that we can work to provide the most benefit; but work on even one of these levels also benefits the other two in the long run. And, so, today, we explore the healing work we can do on the energetic and spirit levels: that of ritual, sacred spaces, gaurdianship, and more. I’ve mentioned before the method of drawing energy down from the sun and infusing the land with light as a way to clear energetically bad places, and we are going to build upon that method (which I shared in my last post in this series, including a barebones structure of a ritual that you can use). In the case of land healing when the land is ready for regeneration, I would suggest more than just a single ritual for this work; where in the case of palliative care, one ritual is all you need or want to do. In the case of land healing, I would suggest either a full year of rituals (four, minimum, at the solstices and equinoxes) and, if possible, the setting of a standing stone to permanently channel that light down and within (I explained the standing stone technique more fully in my earlier post I linked above). In the case of energetic land healing, I find that most of the work I do in this area is drawing energy towards the site and infusing it with healing light. The ritual that I most often use for this is one from the AODA, our seasonal celebrations, which works directly with the three currents and which serves as a land healing and blessing, drawing down the light of the celestial heavens and the sun. I’ve shared a barebones structure of it in my last post. You can purchase the AODA Grove Handbook for a complete version of this ritual for a group (or if you are a member of the AODA, we will be releasing a New Member Guide soon that will include solo versions of the ritual). You can use the structure I provided in my last post, with one major exception: you are doing a series of rituals instead of just one. The first ritual you do should be the one I outlined in the last post–clearing away the energetic darkness. Think of this like the pain and suffering that need to be healed, and only once they are healed, then the light can come within the land. I kind of see this akin to a clay pot–when you start land healing work, the pot is often filled with negative energy, with darkness, and the first thing you have to do is clear out the stuff that’s already in the pot before you can fill it with something better. So the first ritual does that. You can use any other structure as well, with the intention of clearing the space first. So a yearly ritual structure for intensively providing energetic healing support to the land might look like this (using the energies of the season for a guide). I’d personally start this work if possible in the Winter Solstice, but starting the work anytime is also appropriate. 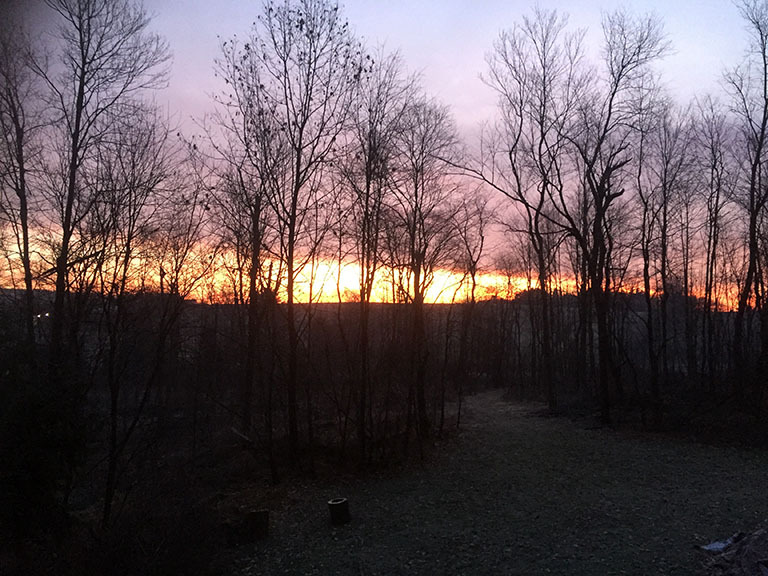 Winter Solstice and/or Spring Equinox: Clearing out the darkness and bringing in some light. 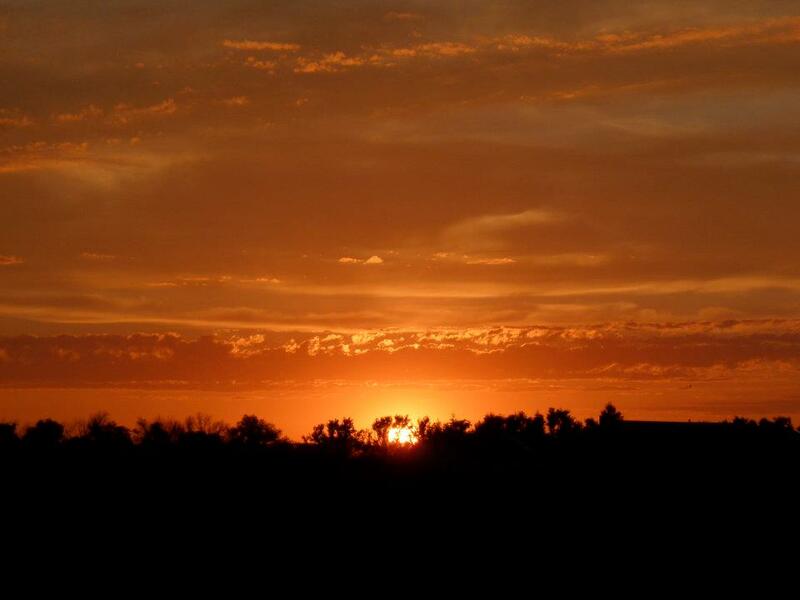 Spring equinox and/or Summer Solstice: Infusing the land with light for a blessing. Fall equinox and/or Winter Solstice: A third infusion of the land with light for a blessing; deep listening on the next steps to take. If you are also setting a standing stone (or even building a stone carin), you can focus your ritual on the stone itself. For the differences in these four kinds of rituals, visualization is effective: imagine the energy coming down from the star, through the sun, and down into the earth, filling the land with light. Purging of darkness, and then, seeing the light infuse into the land, up into the roots, and so on. I have found that establishing a permanent sacred space on the land (even around the entire land that is undergoing healing, if appropriate) is very effective. I have written on this particular thing in a number of posts, so I refer you to my sacred space series of posts for more information on how to do this. One key here is to listen carefully, and to build a sacred space that you can tend and visit often. This might just be leaving a small offering, sitting quietly, observing, meditating–the important thing here is that a sacred space is created by the union of yourself and the land, and your presence is needed for it to continue to function. In the case of my homestead in Michigan, I established the whole property as a sacred space, and worked it diligently in a number of ways. And you should have seen how it grew! On the matter of healing the soul of the land, we must reach out to the spirits of the land if we are able. Some people have particular gifts in this area in terms of direct communication, while others’ gifts lead them in a different direction. Divination tools can be useful here. 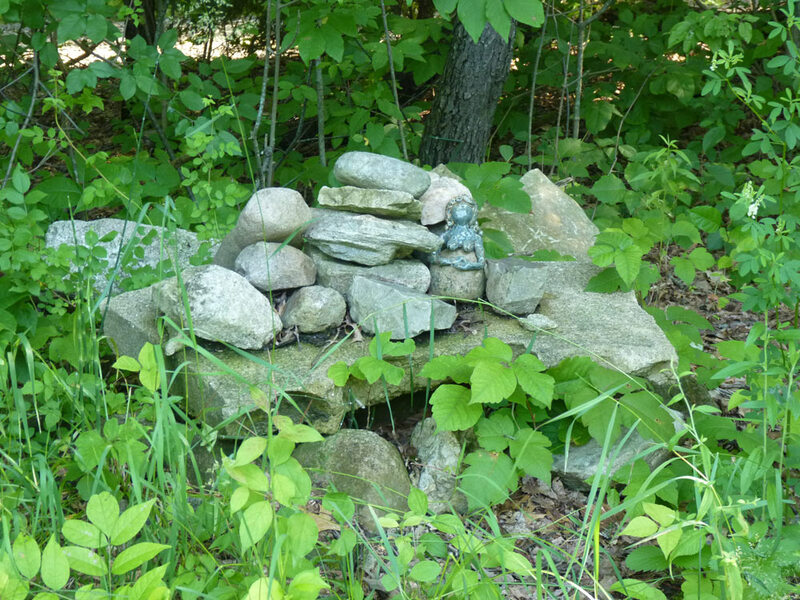 I would say, if nothing else, leaving an offering for the spirits (possibly at a shrine you construct as part of the larger sacred space, above), acknowledge the spirits, and most importantly–welcome them back. Let them know that you are doing work here, that the land is no longer in danger, and that it is safe to return. They will take their time, perhaps, in manifesting, but be patient. And look for signs of any kinds (see my Druid’s Tree Working posts for how to commune with them, the strategies are very much the same). Stones, rivers, and other inorganic features have been around a very long time. Some stones even hold the patterns of fossils of ancient trees. They can temporarily hold this kind of energy until a living elder grows and is established over time. Living elders are important, however. Bringing a piece of an elder from another place can sometimes work. For example, First, find an elder in another place, and see if that elder will let you move a small piece of themselves (like a branch) and place it somewhere you are led to place it. 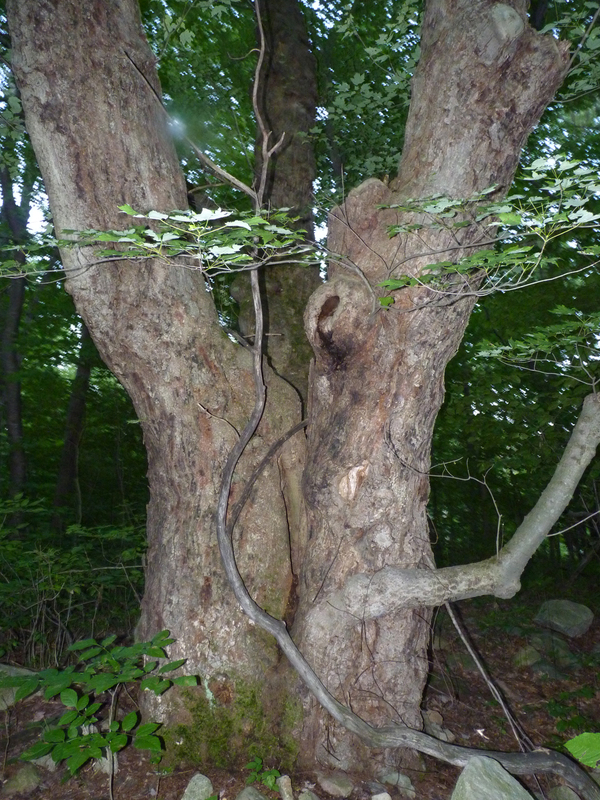 Finding the offspring of an elder who was cut (in the case of a tree, as these elders are often trees) and nurturing that new offspring can also be done. The sacred compact between humans and the land, and the symbiotic relationship between them, is destroyed when the land is stripped bare or otherwise damaged. Re-establishing the human’s role as a guardian and tender of that land is important–and that is something that you can do if you feel led–but only if you feel led. This involves a few steps. First, feel this out out very carefully, making sure that this is something that the land wants and that you can do. The land may want to be left alone to heal on its own for a time, and you don’t want to be there if you are unwelcome. It also needs to be something that you are making a long-term commitment to, so make sure you are stable enough, and rooted enough, for that kind of commitment. Two, if it appears appropriate, making an oath to the land establishing guardianship (I will usually do this as part of a regular ritual at an appropriate day, such as at one of the solstices or equinoxes). Make it clear what you are swearing to, and make sure whatever you swear to, you intend to uphold. Three, regular visitation, vigilance, tending, and time spent–the work of the guardian. This can be anything: from going to the land and visiting, being open and listening, to picking up trash, paying attention to the needs of the land, to protecting it from those who would seek to harm. Regular work on the land should include gaining knowledge about the land: learning it’s history, learning the dominant species and how they interact, studying botany, learning the names and uses of the trees–enough to know if something is amiss. Spend time on the land–overnight, in quietude, moving around–in all those ways. Build sacred spaces. Bring people there to help heal and grow. Think of this land like your focal point for much of what you do! The role of guardian of the land is not one to take on lightly, but if you feel compelled to do so, it is a wonderful way of reestablishing those connections and helping the land heal. It is really a lifetime commitment, and I only mention it here because it is so effective for land healing. I’ll end my discussion today with two physical healing techniques that I’ve mentioned before: as I discussed in my series of posts on refugia and seed arc gardens over the winter months, land that is physically healing. When the land has been stripped bare, it needs the genetic material to regenerate. This requires a knowledge of botany and ecology, but you can easily find lists of plants common to your bioregion, including those endangered. The same is true of endangered mammals, birds, amphibians, and bugs–and the kinds of ecosystems they need to be safe. I very much believe in the work of scattering seeds, of tending the wild, and doing this intentionally as a land healer. Finally, there is a tremendous amount of power in a group of people, a community, coming together to enact healing work. While this can be done doing ritual, like I described above, it can also be done through the physical work of healing the land. In permaculture terms, we call this a permablitz, and it’s a way for people to come together and quickly replant, regrow, and tend the land. I held a number of permablitzes at my own property and also helped many others in blitzes of their own. The land appreciates this so much, as it provides a counter narrative to the many hands who had worked to destroy a place for their own gains. These blitzes are generally focused on a restorative approach–perhaps earthworking (like swales) to hold water, almost always some planting or scattering seeds, and other kinds of work. People want to feel like they are doing something, and blitzes are not only a great way to heal the land but also to help reconnect many with the living earth. Tree in the fall months! This series has been going on for quite some months now–I must say, I was surprised by how much I had to say once I started writing. It took a while to come forth, as some of the subjects were quite difficult to talk about, but I hope this material was useful. I hope it is useful as you engage in your own land healing work, whether you’ve been doing land healing for a long time, or whether you are new to this process. I think this the last post, for now, but I expect that this will be a topic I’ll continue to return to from time to time, as I learn new things and grow in new ways. Thank you for staying with me throughout this journey, and I wish you the best in your own land healing endeavors! I’d love to hear from you more about your own land healing work, and also, as you use these techniques covered in the nine posts, I would love to hear your thoughts, feedback, and experiences. Blessings! 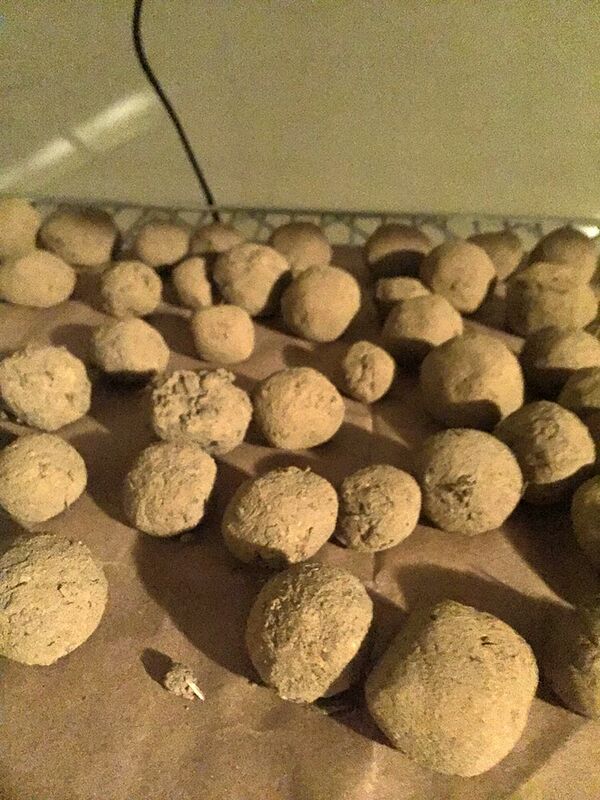 Dried seed balls ready for tossing! This is the last post (for a while) in my series on wildtending. 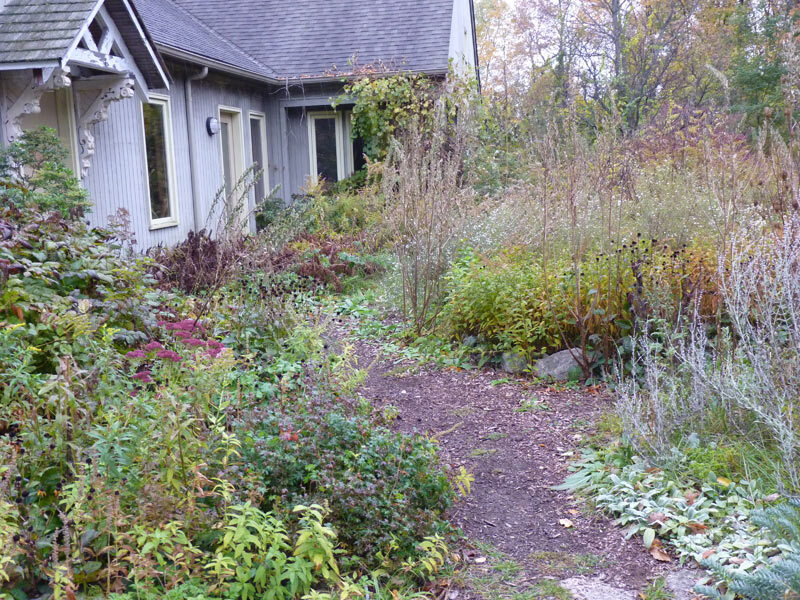 In the last month, we’ve explored the philosophy of wildtending as a sacred action, explored the refugia garden principle, I shared my own refugia garden preparation and design, and finally, we are ready to start scattering the seeds! Perhaps these seeds were gathered from the wilds, given as a gift from a friend, or perhaps, they were gathered from a refugia garden. Wherever you get them, now is the time to begin to scatter these amazing little balls packed with life, love, and magic. Seed balls were invented by Fukuokoa and described in the permaculture classic, One Straw Revolution. They have a number of benefits over other methods for scattering seeds. First, and foremost, they are easy to throw and toss into spaces you can’t reach. A lot guerilla gardeners use them in urban spaces as part of rewilding activities. Similarly, I have found it so much easier to have a bag of seed balls with me and begin tossing them, seeing where they land and if they can grow. I also like them because you can imbue them with some magic (even using some of the earlier energy methods I described with minor modification). They also give the seeds a bit of nutrition to help grow, and the ball itself creates a little platform for growth of the seed as the clay and compost spreads out and as the ball breaks down. There are two downsides–first, roots and larger nuts need separate treatment (obviously; I usually plant these directly by hand), and second, the seed balls can be a bit heavier than tiny bags of just seeds. But I have found them to be extremely useful to have in my foraging bag or crane bag when I’m out and about in the world! So here we go–Let’s roll up our sleeves, find a few friends, and make some seed balls! 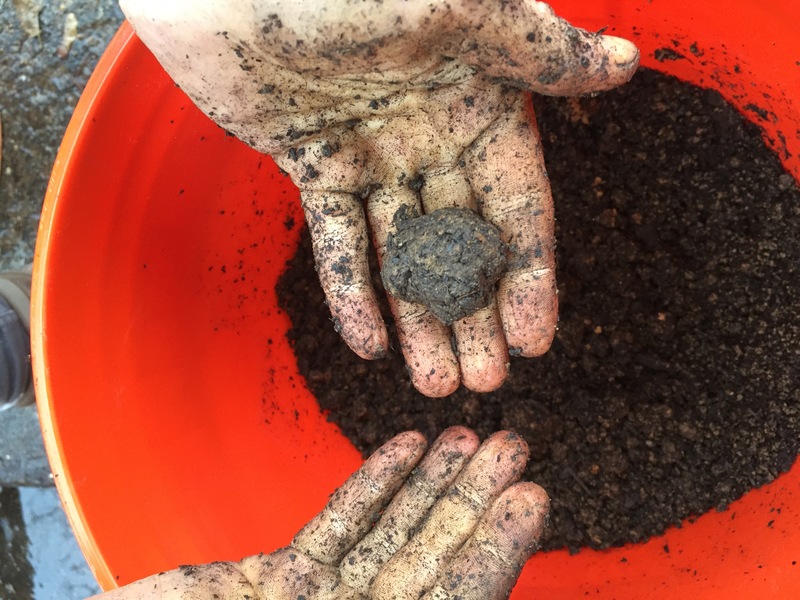 There are three pieces to seed balls: seeds, clay, and compost as well as some simple tools to work with. We’ll talk about each of these in turn. A bit part of making seed balls is ethical sourcing–if done right, you shouldn’t have to buy anything (or much of anything). The first step is to get some seeds. Deciding what to put into a seed ball depends on what you have access to (like in my case, see below) but also what you want to spread–see my first post in this series for suggestions of endangered and at-risk medicinal plants, for starters. You can spread whatever seeds your ecosystem needs–I’m focusing my energies right now on medicinal plants and tree seeds. You can gather these in the wild when they are in abundance or you can start growing the key plants in a “refugia garden” as I described in a recent post. Or you can find them in…other ways. Since my garden is still in process, I was in the search for seeds this summer. In my last post, I gave some lists of potential plants for different ecosystems–check out this list for more ideas about seeds to spread, but I would strongly suggest studying up on your ecosystem and thinking about where you might share these balls. Searching out seeds is a longer-term process, something to keep in your mind for the upcoming season! Despite the fact that I didn’t find hardly any New England Aster or a few other key plants, like Blue Vervain and Echinacea upon my return to the northern Appalachians, I stumbled across a native plant garden at a local park. And, even more delightfully, they had just trimmed the garden back for the fall, and there was a pile of plants there just going to seed in a pile waiting to be carted off…and so…well, I helped myself. This gave me a wonderful set of seeds–here are a bunch of the aster seeds drying. I also found an abundance of milkweed, boneset, and swamp milkweed to round out my stash. Perfect! 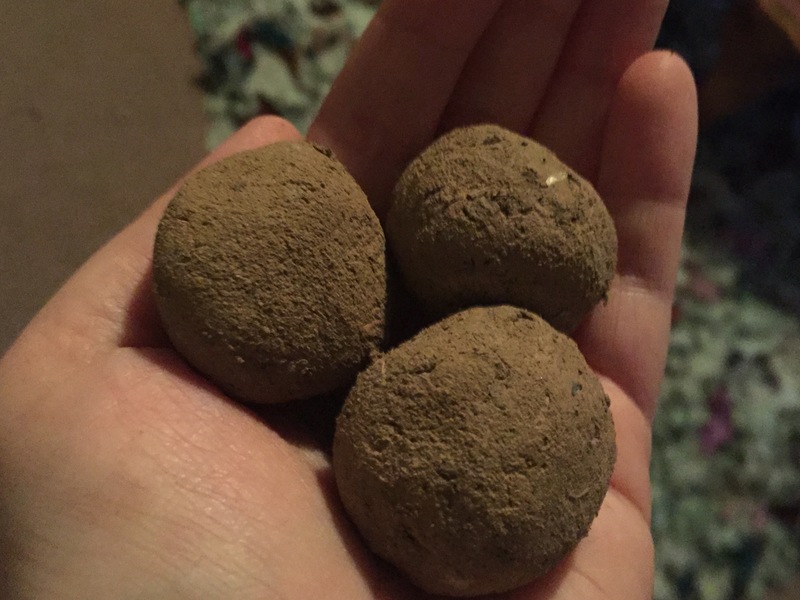 I decided, given my delightful treasure trove of full-sun seeds, to make a set of seedballs geared toward medicinal, hard to find perennial plants that grow in full sun. Now in his book, Fukuokoa used a local clay, “red clay” and there’s been some discussion in various permie forums on whether or not “red clay” is necessary. No, it is not–any LOCAL clay will do. Please, please, please don’t go buy clay unless you have none in your local ecosystem (and chances are, you do). 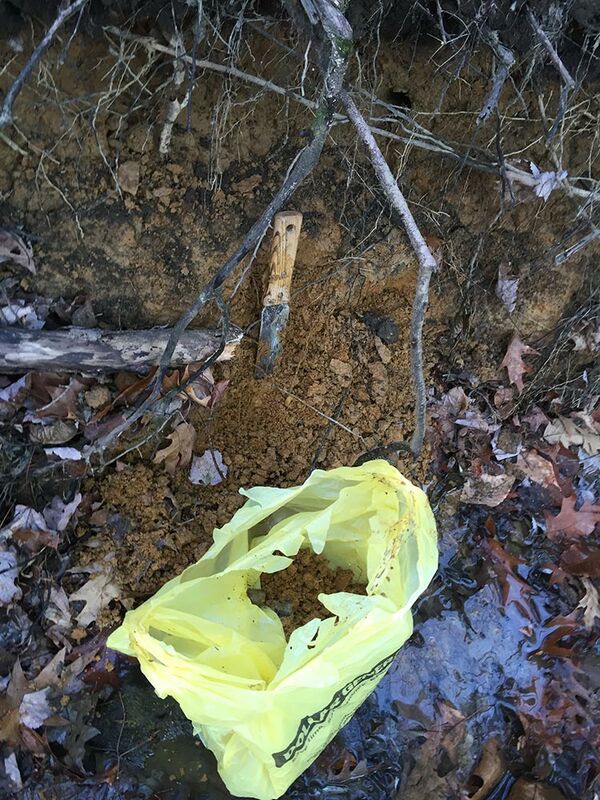 In most places on the planet, clay will be part of your natural subsoil and its just a matter of finding some. Look when people are digging holes into the subsoil, look at eroding banks of rivers after flooding, look at new construction–you will see it. Its heavy, retains water, and is sticky. 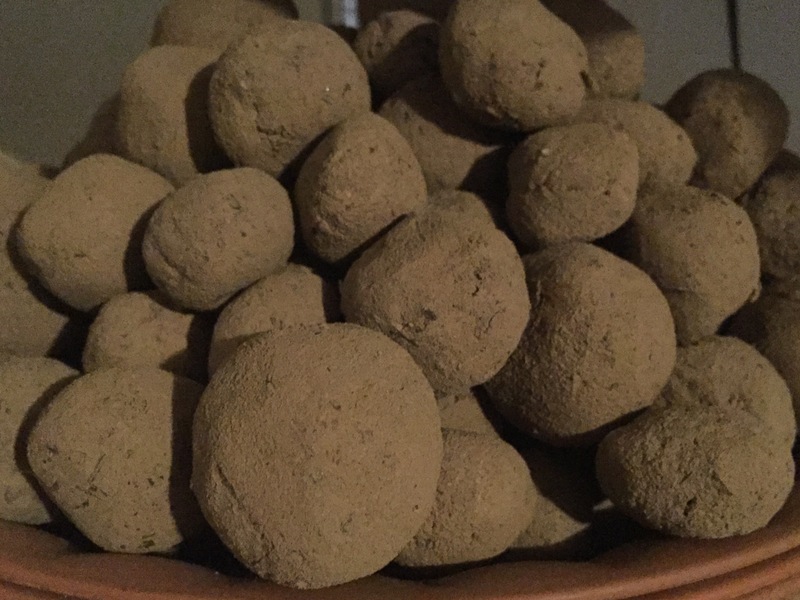 The reason I say don’t buy any clay is because its very fossil fuel intensive to ship due to its weight. In PA and in Michigan, when you dig down, you can easily find clay. I prefer to dig mine out of banks by streams or the side of the road. I knew of a wonderful bank by a forest stream, so I went on a hike to get some. I used my hori hori to dig my clay; the hori hori is a Japanese garden tool and is my favorite foraging tool. To dig your clay, literally any little trowel or shovel will do. Since I’m digging it from a soft bank, I primarily took clay from the bottom of the bank where it already had spilled over to prevent further erosion. I used a doubled plastic shopping bag to put the clay in. After digging, I put it in my bag and lugged it 1/2 mile back up the mountain :). 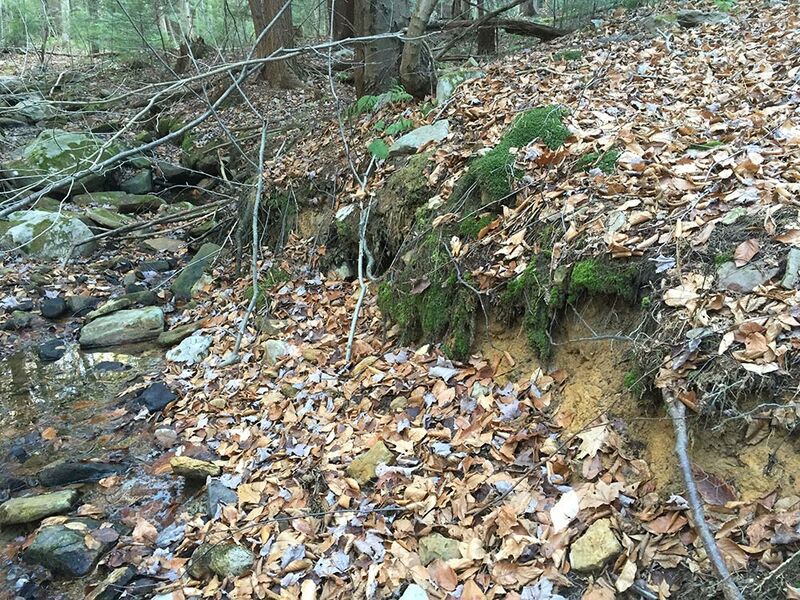 Of course, not a week later, I saw a bunch of clay deposits on the side of a back country road, having been dug up from last year’s plowing. Ah well! I pretty much got as much clay as I could carry up the mountain all that way, or about 25 lbs. The recipe I’m going to give you is based on simle ratios, so however much you get is fine. Before you set about making your seed balls, you will need some other supplies. I should also mention that seed ball making is VERY MESSY and should, at all possible, be done outside or in like a dusty garage or something. 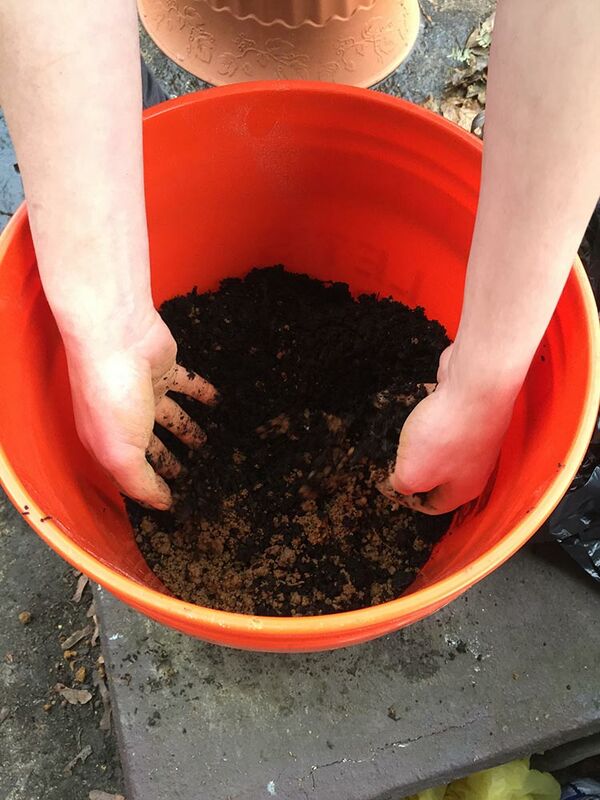 Compost: In addition to clay and seeds, you’ll need some sifted and finished compost or top soil (something seed free). Chicken-created compost, as is any home compost or worm castings. Any rich soil will do. 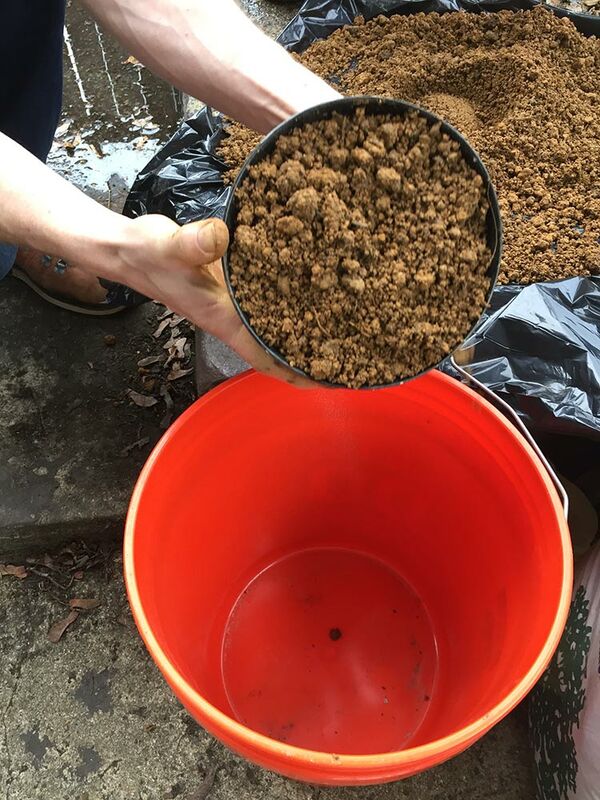 If you think you have unwanted seeds in the soil that you don’t want to spread, you can bake the compost at 350 degrees for 10 minutes (but this may kill off other microbial life, so be warned). A large plastic bucket is necessary for mixing. A 5 gallon bucket works well. A bucket of water for cleaning your hands and adding water to the mix. If its cold outside, make it warm water! An old towel is also a good idea for cleaning your hands. A small tarp or large garbage bag. This will be for sorting out your clay, adding your seeds, and so on. A few friends. Good friends make seed ball making fun! The process is simple enough, and I took photographs of each step to help you along. 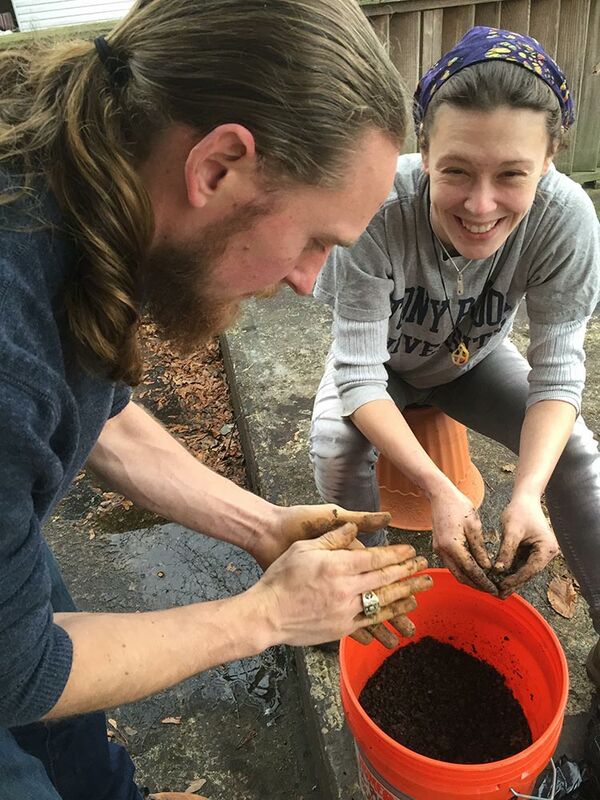 The first thing you want to do is to make sure your compost and your clay is free of debris, woody material, leaves, or stones. Since my clay was wild clay, we had some sorting to do. It was a little wet, but that was fine. It could have been a little dry as well. If your clay is super wet, you might want to lay it out for a few days to dry out a bit before starting. The key is finding that “just right” texture that is more on the dry side than the soupy side. Most clay you dig right out of the earth will be the perfect consistency. We took out the big lumps, sticks, and rocks. Next, you’ll want to measure your clay. 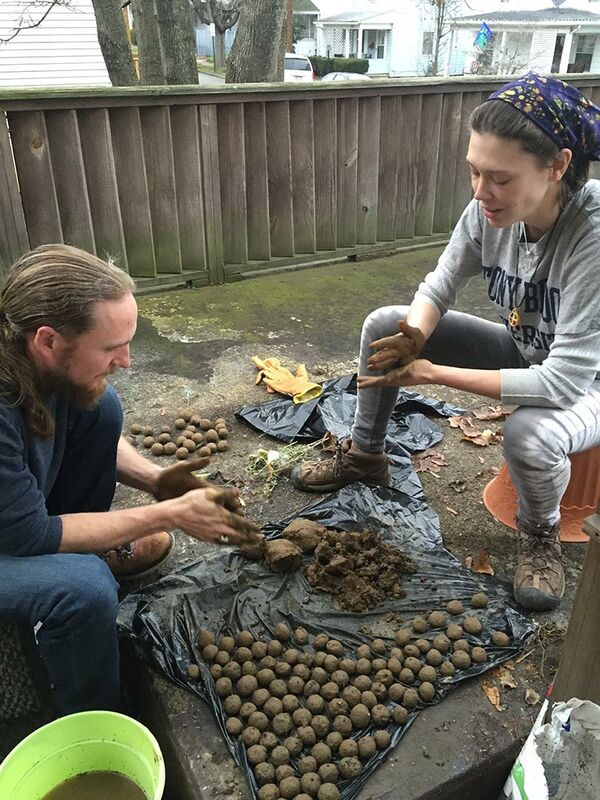 You want to use a ratio of about 2 parts clay to 1 part compost–enough to form nice balls. Part of this will depend on the kind of clay you have (and if it is pure or has anything else in it, like a little bit of sand). We used a flowerpot to measure out or clay (2 parts clay). We added our finished compost (1 part) and mixed the clay carefully. 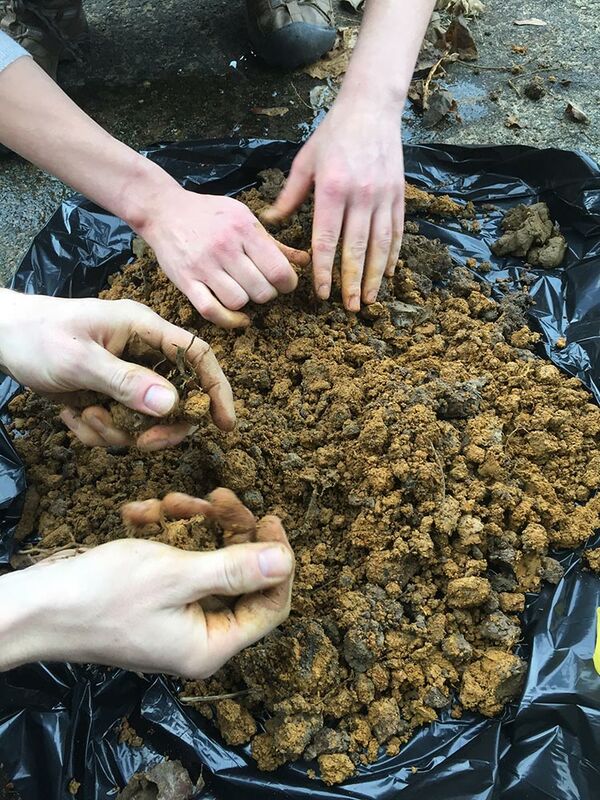 Mixing the clay and compost – good to get your hands in the soil! After mixing, we tested the seed balls to see if they stuck together. Sometimes, you might need to add a bit of water, depending on how moist the clay was. We added about 1 cup of water to our bucket and then checked to see if it formed a ball. If it forms a nice ball, its ready to go. At this point, we found that its helpful to spread the material out on the tarp/plastic bag so that you can get an even amount of seeds in each ball. After spreading out our mixture, we have begun to add aster seeds. You pretty much add as much seed as you like–the balls that we’ve made this time and in the past generally had a lot of seeds! We added a lot of seeds–in this batch, it was what I could find: blue vervain, pleurisy root/swamp milkweed, blue vervain, milkweed, and some stinging nettle. Our lovely seeds spread out! The milkweed puffs don’t seem to matter (and in fact, seem to give the balls strength). Neither do bits of dried plant matter, etc. Once the seeds were spread out, we mixed everything together and began forming our seed balls. There are a few strategies to make the balls–one that Paul showed us was to roll out a long “worm” (ok, it totally looks like a turd) and then break off smaller bits, forming them into balls. We made a good number of balls–probably 120+ with the mixture we had made. Since its winter here and the weather is generally quite chilly in January, I ended up laying my balls on my seed starting rack that I just put up. It is near a heat register, which allowed them to dry quite quickly. I put them down on some paper bags I had cut up. Put them in the center of your circle during a druid holiday. I’ll be blessing my most recent batch at Imbolc in a week or so. You can make these on a full moon, on a holiday (Samhuinn or Yule being a good example) for added effect. Finished, Blessed Seed balls are ready to go! Scattering the seeds is a huge part of the fun. I like to make extra and give them as gifts to those who would appreciate them–then the seeds can go even further. The easiest way of scattering them is just tossing them wherever you want them to grow. Remember that some seeds need a cold period (cold stratification) so tossing them even in the wintertime isn’t a bad idea! The sky is the limit in terms of these seeds. Make yourself a little bag, take it with you where you go, and have fun! With each toss, you regenerate the land, bless the land, and scatter abundance.